Note: Statements following sources listed in bold are direct quotes. Please contact us if you find any broken links or if you want to suggest new events to include in this timeline. 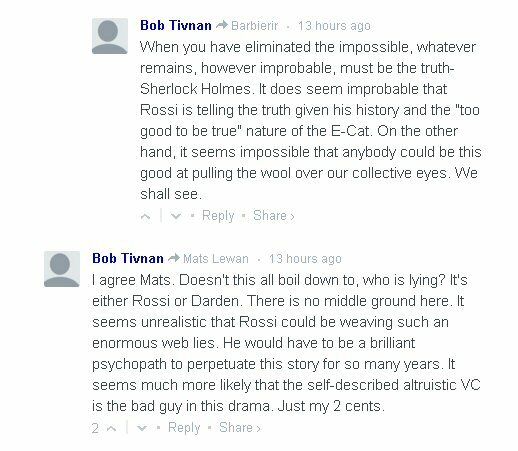 April 8, 2016 Bob Tinvan on E-CatWorld: "It seems unrealistic that Rossi could be weaving such an enormous web of lies: he would have to be a brilliant psychopath to perpetuate the story for so many years." April 4, 2016 New Energy Times publishes Exposing Defkalion Version of Rossi E-Cat. Luca Gamberale’s report is on Defkalion Green Technologies’ version of Andrea Rossi’s Energy Catalyzer. 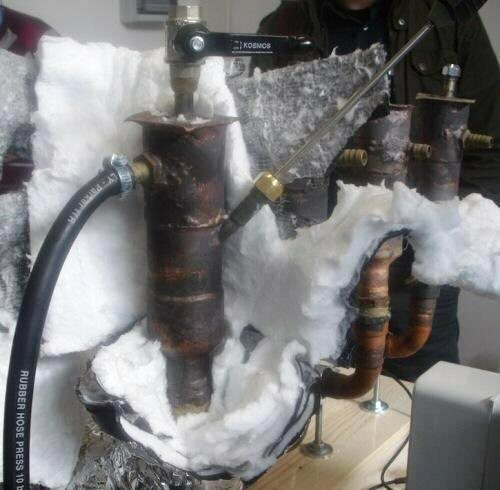 The report shows how Defkalion created an illusion of a LENR-based energy device. It reveals how Defkalion may have duplicated what Rossi was doing. March 29, 2016 Rossi demands the remaining payment of $89 million from Industrial Heat. 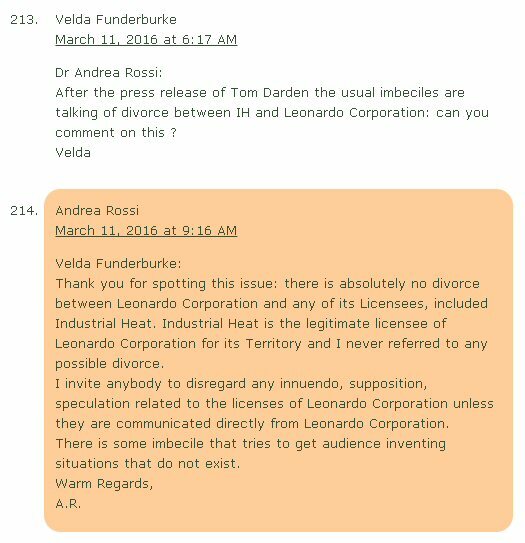 March 10, 2016 Industrial Heat issues a statement and apparently terminates its relationship with Andrea Rossi. March 8, 2016 New Energy Times sends a news inquiry to Thomas Darden and asks questions to verify Mats Lewan’s Feb. 18, 2016, blog entry. Feb. 29, 2016 New Energy Times reader Stephen Goodfellow tells Krivit about Mats Lewan’s Feb. 18, 2016, blog entry. Feb. 17, 2016 According to Lewan, Rossi and Industrial Heat have completed a 1-year test of a 1 MW Rossi device. Oct. 9, 2015 Thomas Darden promotes Rossi in Triangle Business Journal. Sept. 27, 2015 Thomas Darden promotes Rossi in Fortune magazine. Oct 16, 2014 Uppsala University physicist Stephan Pomp writes sarcastic but incisive commentary on Rossi's manipulation of isotope samples. Oct. 12, 2014 New Energy Times publishes "Rossi Handles Samples in Alleged Independent Test of His Device"
March 29, 2014 Levi, Foschi, Höistad, Pettersson, Tegnér, Essén perform measurements on test performed at independent location on device built and operated by Rossi. Rossi inserted and extracted sample material that later tested positive for istopic shifts. Jan. 28, 2014 Sven Kullander dies. Jan. 24, 2014 J.T. 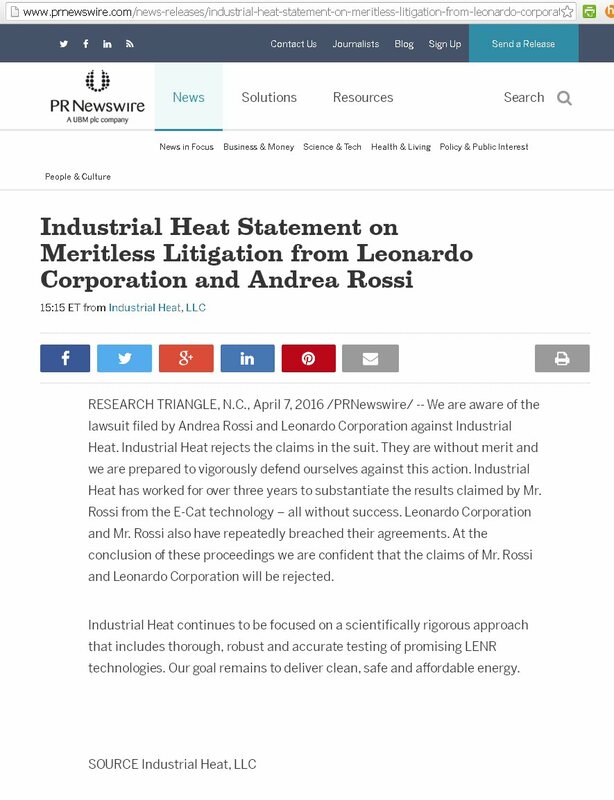 Vaughn, the vice president of Industrial Heat, announces in a press release that Industrial Heat has acquired intellectual property rights from Andrea Rossi. July 10, 2013 Sergio Focardi dies. June 26, 2013 Göran Ericsson and Stephan Pomp, professors in the Department of Physics and Astronomy at Uppsala University, uploaded a critique that reports serious deficiencies in the May 16 (May 20) paper written by seven researchers, including three professors at Uppsala. June 4, 2013 New Energy Times publishes "More Ethics Questions: Uppsala University Hides Failed E-Cat Test"
May 21, 2013 New Energy Times publishes "Rossi Manipulates Academics to Create Illusion of Independent Test"
May 20, 2013 Mark Gibbs (Forbes) buys off on "independent test"
Essen uploads paper to arXive (archive OCR'd copy) (Revised May 20) In Dec. 13, 2012, and March 18, 2013, tests, sponsored by Elforsk, Essén and co-authors claimed that they performed an independent test of an E-Cat device that was built by Andrea Rossi. The test was performed on one of Rossi’s devices in Rossi's facility. The authors performed measurements on the test. March 6, 2013 Rossi appears on Tom and Doug comedy music show. Program features the never-to-be-a-hit song "I Believe in the E-Cat," and compelling Q&A from listeners such as "How come the only place I hear about the E-Cat is on the Tom and Doug show?" Oct. 2012 Industrial Heat makes first payment to Rossi, in the amount of $1.5 million. Oct. 26, 2012 Industrial Heat and Rossi execute license agreement. March 29, 2012 New Energy Times publishes "Rossi's Steam Trick: Lewan Knew." March 28, 2012 New Energy Times publishes "European Financial Editor Says No to Energy Catalyzer." 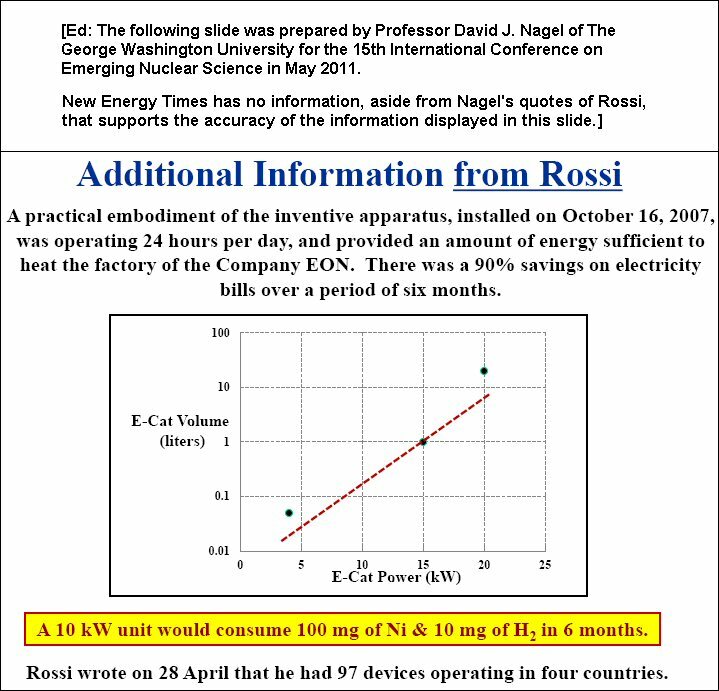 March 27, 2012 New Energy Times publishes "Proof of Rossi’s Deception." March 11, 2012 Sterling allen writes on PESN: Rossi has been caught in some whopper lies...I apologize to anyone that I've encouraged to try and do business with Andrea Rossi, and I retract my endorsement. 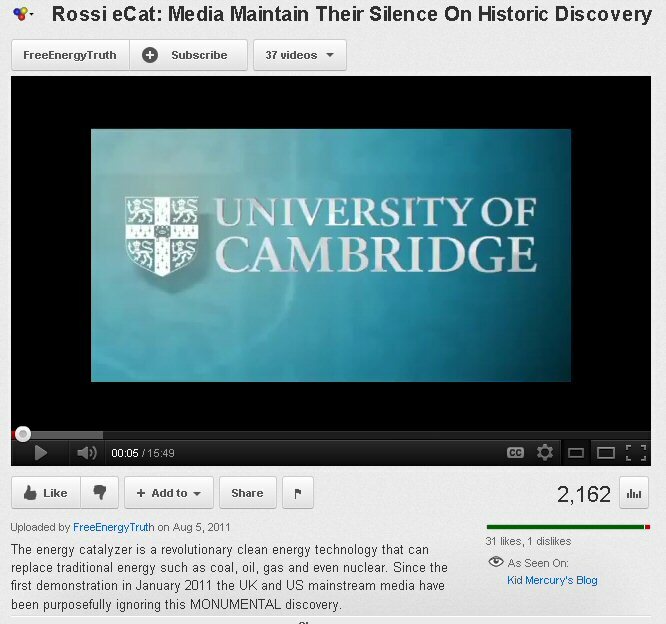 March 11, 2012 Brian Josephson of University of Cambridge puts disclaimer on his video endorsement of Rossi and says that he was not endorsing Rossi. 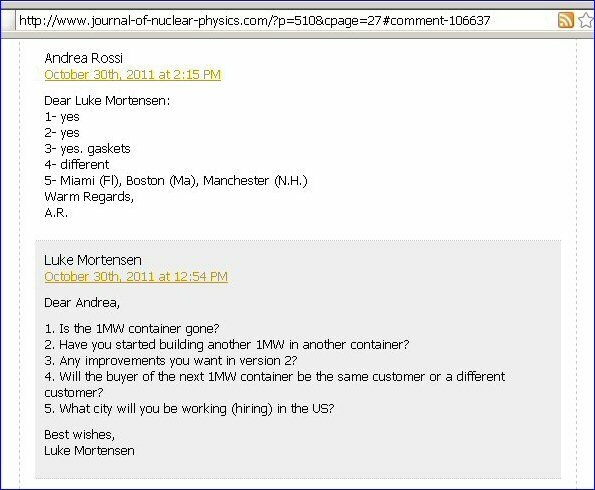 March 10, 2012 Jed Rothwell, librarian of LENR-CANR and early promoter of Rossi states on Vortex-l e-mail list "I do not think the Rossi ever claimed there is a nuclear reaction in his device." March 10, 2012 New Energy Times publishes "Florida Bureau: Rossi Has No Factory, No Nuclear Reactions." March 9, 2012 Florida Bureau of Radiation Control completes its investigation and report. March 10, 2012 New Energy Times publishes "Rossi’s Financial and Environmental Criminal History." March 9, 2012 New Energy Times publishes "Rossi's Italian Financial and Environmental Criminal History." March 7, 2012 New Energy Times publishes "Report #5: Rossi's Profitable Career in Science"
March 6, 2012 Mats Engström takes over as new editor-in-chief of Ny Teknik. March 6, 2012 New Energy Times publishes this timeline. March 6, 2012 Krivit sends media inquiry to Sven Kullander. March 3, 2012 New Energy Times publishes "Rossi Misplacement of Thermocouples Appears Deliberate"
March 2, 2012 Julia Betts of National Instruments clarifies Rossi matter. Betts: Our interactions did not go beyond initial discussions and we did not design a control system for them. We are not currently, nor have been for some time, in current discussions or working with [Rossi]. March 2, 2012 New Energy Times publishes "Pettersson Finds Major Flaw But Still Believes in Rossi’s E-Cat"
March 2, 2012 Next Big Future publishes interview: "Steven Krivit and the Troubling Case of Andrea Rossi." March 1, 2012 New Energy Times publishes "Navy Commander Halts SPAWAR LENR Research." 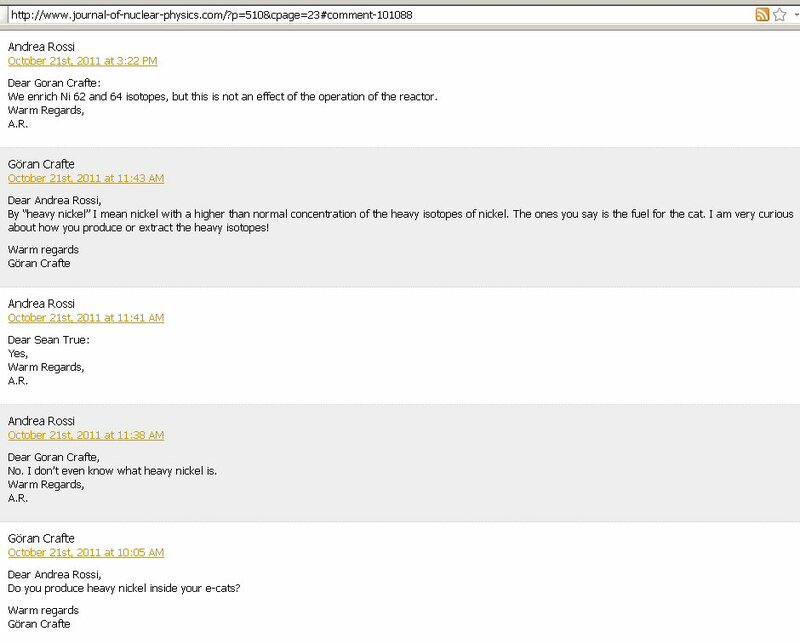 SPAWAR commander halts LENR research after Fox News publishes false association of SPAWAR with Rossi Energy Catalzyer. Feb. 25, 2012 Frank Ackland writes on a blog that Rossi is talking with Siemens. Feb. 21, 2012 Rossi writes on his blog: The 1MW plants are already for sale. Feb. 21, 2012 Krivit writes blog comment that General Electric Power Systems and Siemens have visited New Energy Times Web site in previous years. Feb. 20, 2012 Lewan reports that Rossi performs another test. Test fails to show convincing evidence to support Rossi's heat claim. Feb. 19, 2012 Rossi confirms business relationship with National Instruments is over. 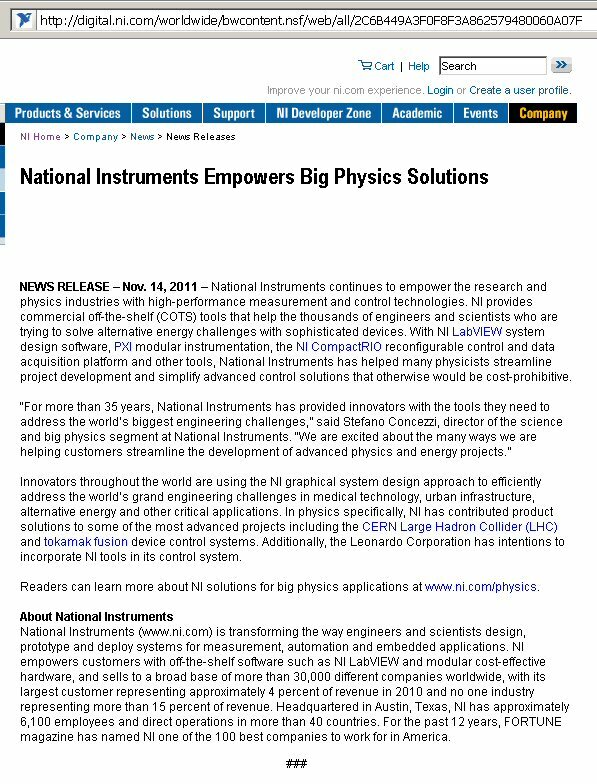 Feb. 18, 2012 New Energy Times publishes "National Instruments Denies Relationship With Rossi." 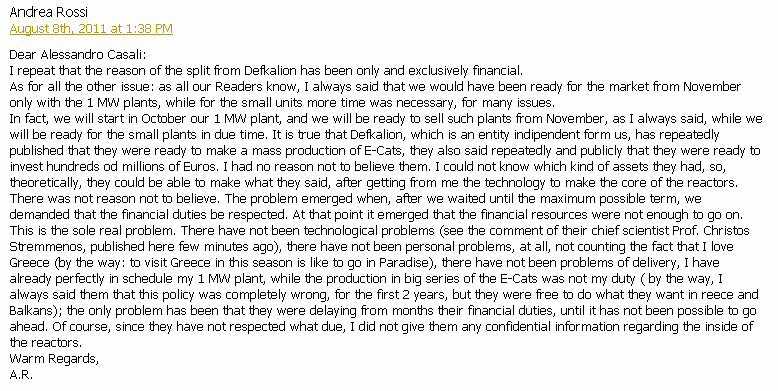 Feb. 18, 2012 New Energy Times publishes "Rossi Blames E-Cat Delivery Discrepancy on Translation Error." According to Rossi, he did not lie that the customer had physically taken delivery of the E-Cat, it was merely a translation problem. Feb. 18, 2012 Rob Duncan changes his mind about buying two Energy Catalyzers. Duncan: I took a closer look at this, and we have decided not to pursue an E-Cat purchase at this time, but we will be very interested to track how this progresses. Feb. 17, 2012 New Energy Times publishes "Rossi E-Cat Never Delivered To Customer; Needs Gaskets." 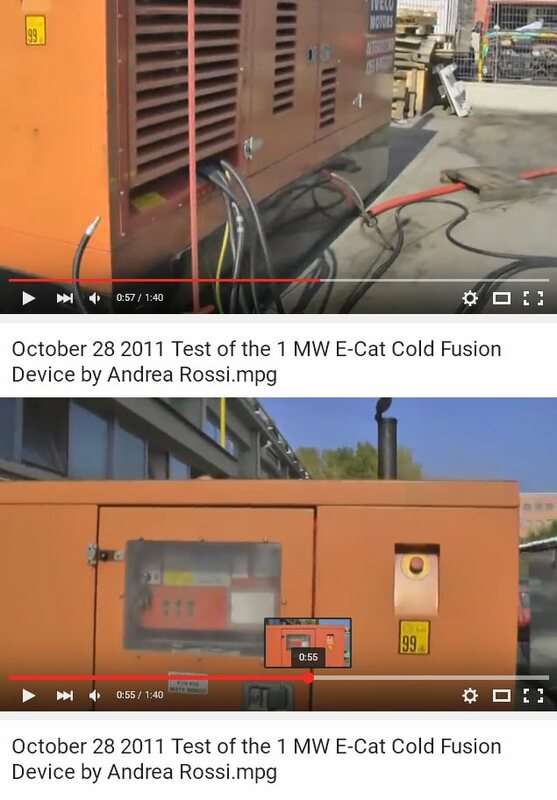 A Jan. 12, 2012, promotional video on Rossi’s Web site, Ecat.com, shows the same 1MW E-Cat sitting in the same place where it was “tested” by “the customer” three and half months ago. Feb. 17, 2012 Rossi writes on his blog: Our Customers are working in peace, we too, our patents are going through, and when we will put our product in the massive market, well protected by our patents and by very cheap prices, your dreams to see an E-Cat working in your house will be reality. Feb. 17, 2012 Rossi writes on his blog: In Autumn we will surely send the detailed offers to all the “horde” of pre-orderers. The deliveries will start hopefully within the next winter, surely within 18 months. Your paper will be very welcome, please send it now to the Journal info@journal-of-nuclear-physics.com for peer reviewing. 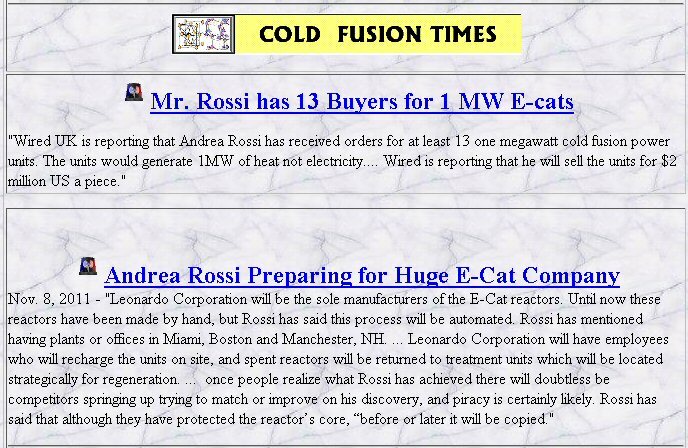 Feb. 16, 2012 New Energy Times publishes "Leonardo Corporation Buys E-Cat Rights from Rossi’s Wife." According to Lewan, Rossi and his wife, Maddalena Pascucci, each own 50 percent of the company. According to a Jan. 26, 2012, document filed with the European Patent Office, Leonardo Corporation paid €10,000 to Pascucci for the rights. According to real estate records, 1331 Lincoln Road, Suite 601, Miami Beach Fla. is an apartment owned by Pascucci. Corporate registration of the couple’s company shows it located one flight below, in apartment 505. New Energy Times has been unable to identify in which apartment the couple have their factory with the 300 E-Cat nuclear reactors. Feb. 16, 2012 Rossi announces license policy, international status and E-Cat convention. Rossi: I must add that practically all the world’s Territories have been already licensed. Soon we will organize a convention of all our Licensees, for the presentation of the E-Cat, in the final shape that will be marketed, and in that occasion we will give the full list of all our Licensees. The most important Territories in which we have not yet found the right licensee are: 1- Russia 2- Japan. Feb. 15, 2012 Rossi answers more questions about Smith offer . Rossi confirms that invoice was real, but that it expired unpaid. Feb. 15, 2012 New Energy Times publishes "Rossi: No Need for $1 Million, Just Send $131,000." Reveals invoice Rossi sent to potential investor. Feb. 14, 2012 Krivit asks Rossi, if Smith purchases E-Cat, when Rossi can deliver. Rossi answers indirectly on Feb. 17, 2011. Feb. 14, 2012 Rossi declines Smith offer, says he can purchase an E-Cat if he wants, if he waits. Feb. 14, 2012 New Energy Times publishes "Smith Offers $1 Million Prize for Successful E-Cat Demo." Feb. 13, 2012 New Energy Times publishes "Rossi’s Australian Investment Opportunity Falls Through." Feb. 11, 2012 Robert Duncan, vice chancellor for research at the University of Missouri, announced his intention to purchase two of Andrea Rossi’s Energy Catalyzers. Feb. 10, 2012 New Energy Times publishes "Report #4: Rossi’s NASA Test Fails to Launch." Feb. 8, 2012 New Energy Times publishes "SPAWAR LENR Research At Risk." Jan. 26, 2012 Maddalena Pascucci transfers European Energy Catalyzer patent application rights to Rossi's Florida Leonardo Corp.
Jan. 25, 2012 Rossi denies that University of Bologna contract is cancelled. Rossi asks his fans to distribute his message everywhere. Jan. 24, 2012 Krivit explains why copper isotope claims are meaningless. 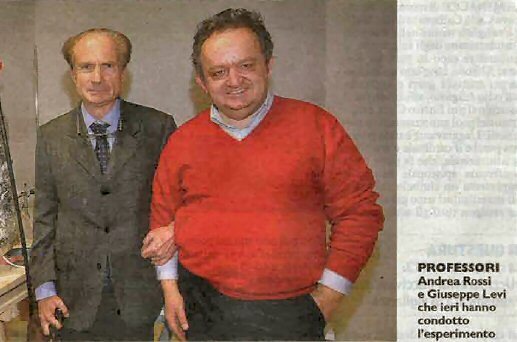 Jan. 24, 2012 New Energy Times publishes "University of Bologna Terminates Relationship With Rossi." 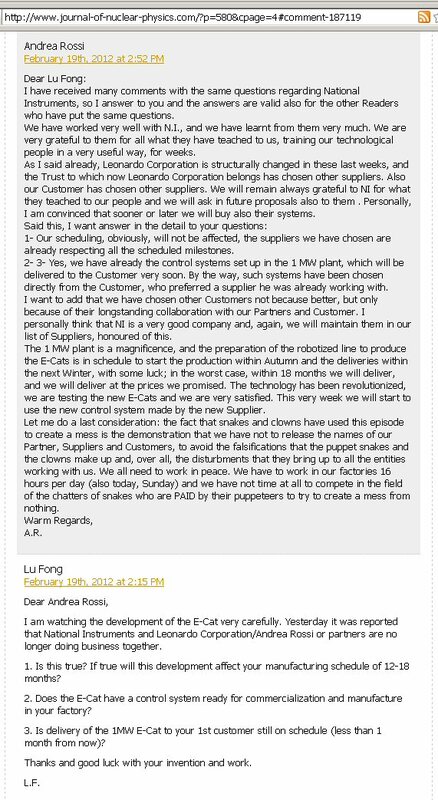 Jan. 19, 2012 Rossi explains on his blog why 1 MW E-Cat was not delivered. 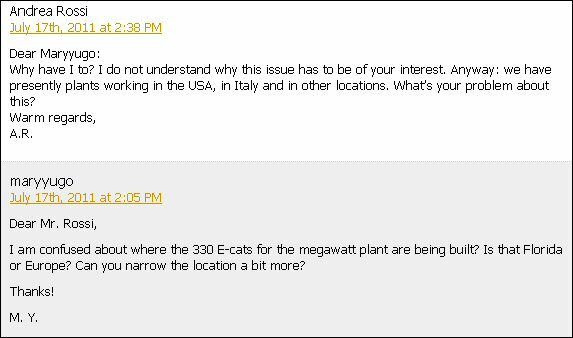 Jan. 19, 2012 Rossi fans ask on Rossi's blog why 1 MW E-Cat was not delivered. Jan. 15, 2012 University of Bologna terminates relationship with Rossi. University does not announce it until Jan. 26, a day and a half after New Energy Times made an inquiry to the university. Jan. 12, 2012 Rossi shows a promotional video that reveals that the 1 MW E-Cat hadn’t moved. Jan. 11, 2012 New Energy Times publishes "Rossi’s Engineering School Shut Down for Fraud." Jan. 7, 2012 New Energy Times publishes "The Failure of Rossi’s Energy Catalyzer, Caught on Video." 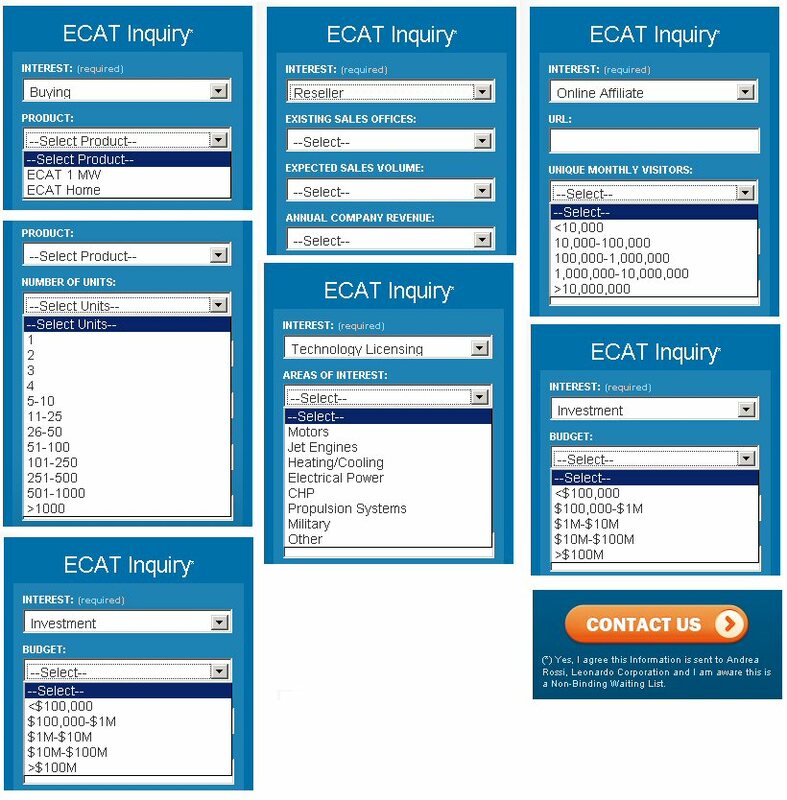 Dec. 3, 2011 New Energy Times publishes "The E-Cat Tribe," listing of 81 E-Cat Web sites. Dec. 21, 2011 Srinivasan writes: In the recent months he (Iyengar) was very happy to learn of the development of the Ni-H Rossi reactor and the imminent commercialisation of Cold Fusion/low energy nuclear reactions. Iyengar's bold and far sighted stand on this controversial subject stands vindicated. Srinivasan feels vindicated by Rossi too. Dec. 16, 2011 New Energy Times publishes "More Slides From Sept. 22 NASA LENR Innovation Forum." Dec. 9, 2011 New Energy Times publishes "Duncan’s Promotion of Rossi: A Tremendous Disservice." Dec. 4, 2011 New Energy Times publishes "Slides From Sept. 22 NASA LENR Innovation Forum Workshop." Nov. 28, 2011 New Energy Times publishes "A Conversation With Thomas Blakeslee." Nov. 27, 2011 New Energy Times publishes "Rossi: Declining Magnitude of Claims." Nov. 27, 2011 7 Gold News TV Magazine (Italy) films Dario Braga, director of scientific research of University of Bologna. Braga: Faculty of the University of Bologna are not part of the Rossi device evaluation until the University can start with its own experiments. The Rossi contract must start soon otherwise the University of Bologna can withdraw from the contract. It must be understood that the period can be a few weeks, maybe a few months but for sure not years. Nov. 26, 2011 New Energy Times publishes "Rossi Declines Italian and U.S. Government Testing Offers." Nov. 24, 2011 Rossi writes on his bog that he deceived Defkalion. "It was just a trap we made." Nov. 23, 2011 Two sources who attended the Kullander lecture wrote that, according to what Rossi told Kullander, the Energy Catalyzer can work without the secret catalyst. Kullander audio transcript (37:05): Men han säger det fungerar lite grann med nickel bara men just när man lägger i tillsatser som det fungerar riktigt ordentligt. och va dom är det är frågan. Kullander statement English translation by Ericsson: He [Rossi] says it works a little bit with only Nickel but its when you add additives that it works correctly and what they are is the question. Nov. 23, 2011 Kullander gives lecture on Energy Catalyzer. Nov. 23, 2011 Focus.it reports that Rossi declines Josephson's and Celani's invitation for independent scientific test. 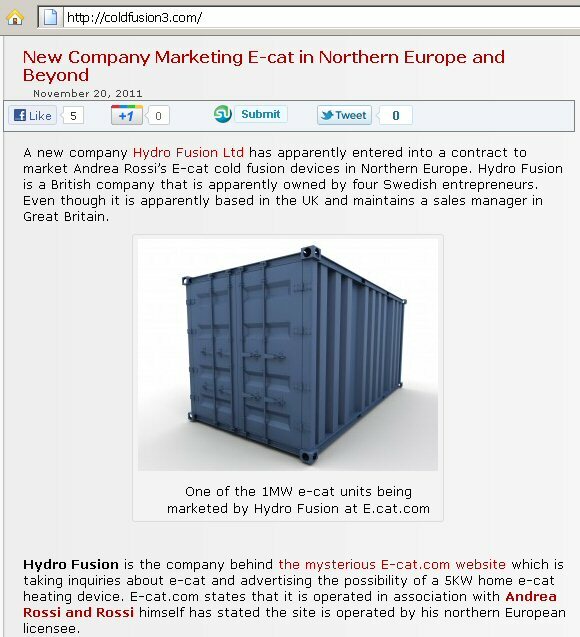 Nov. 20, 2011 A Rossi fan blog writes story about Rossi's affiliation with E-Cat.com and Hydro Fusion . Nov. 21, 2011 Focus.it publishes letter from Brian Josephson. Josephson makes invitation to Rossi for independent scientific test. Nov. 18, 2011 Rossi's ECat.com Web site's various solicitations. Nov. 18, 2011 New Energy Times interviews Roland Pettersson. Nov. 17, 2011 Ed Storms sends email to CMNS e-mail list. Storms: From my study of the Rossi claims, the possibility of this being fraud is zero. The possibility of it being real is 100%. The possibility of it being a successful product at this stage is 25%. Therefore, failure of the community to support Rossi would be contrary to everything the community has been trying to accomplish and contrary to the future of the world with respect to finding a clean energy. The stakes are too high to play games. Nov. 17, 2011 Lewan quotes Magnus Holm, affiliated with Rossi's Ecat.com Web site. Holm: Further support that it’s real comes from the fact that all independent physicists who have observed the tests are positive. Nov. 16, 2011 Ny Teknik news chief Norbert Andersson defends against Swedish Public Radio critique. Nov. 14, 2011 National Instruments issues news release, mentions Rossi. Nov. 12, 2011 Swedish Public Radio critiques Lewan and Ny Teknik. Nov. 12, 2011 New Energy Times publishes "Rossi’s Mystery Customer Performs Disappearing Act, Twice." Rossi fans believe Rossi's "first" customer is SPAWAR. SPAWAR denies. Then Rossi fans believe "first" customer is National Instruments. 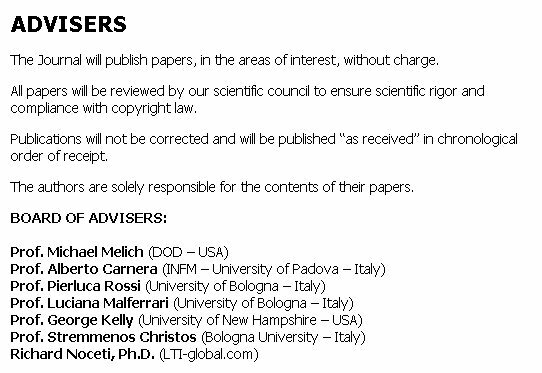 Nov. 11, 2011 New Energy Times publishes "University of Bologna Denies Faculty Involvement with Rossi." 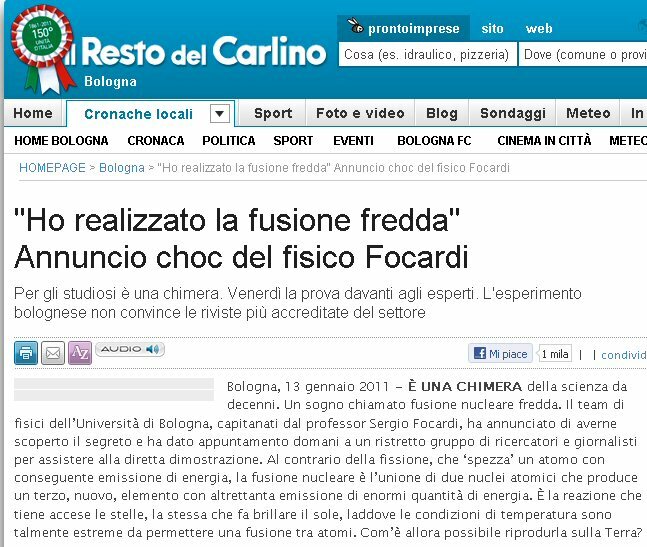 Nov. 11, 2011 University of Bologna (Storchi) tells New Energy Times that the Nov. 5, 2011 press release was written by Dario Braga, the vice president for research and Paolo Capiluppi, the head of the physics department. Note: On Nov. 16 Rossi directly contradicts himself. Nov. 11, 2011 Sterling Allen promotes Rossi and also is seeking business relationship with Rossi. Nov. 10, 2011 Mitchell Swartz promotes Rossi. Nov. 10, 2011 New Energy Times publishes "The Big Lie Technique of Scammers, Courtesy of Adolf Hitler." Nov. 9, 2011 New Energy Times publishes "Sterling Allan: Arm-in-Arm with Andrea Rossi." Nov. 9, 2011 New Energy Times publishes "Poor Journalism by Fox News on Rossi Story." Nov. 9, 2011 New Energy Times publishes "Poor Journalism by Physorg on Rossi Story." Nov. 9, 2011 New Energy Times publishes "Poor Journalism by Wired U.K. on Rossi Story." Oct. 30, 2011 New Energy Times publishes "Noble Aspirations Are Not Enough." 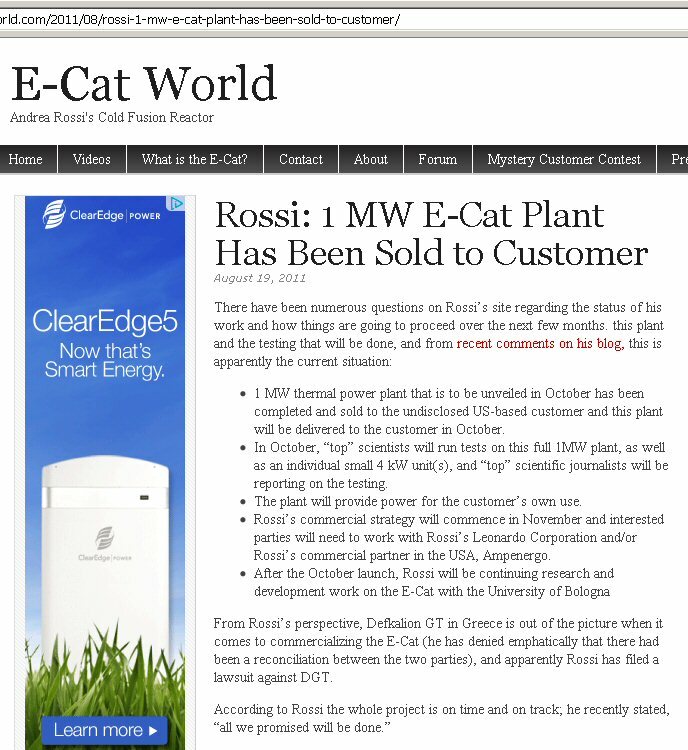 Oct. 30, 2011 Rossi writes on his blog that the 1 MW E-Cat is gone. Oct. 29, 2011 Lewan reports on the Oct. 28, 2011 test. Lewan: According to the report, the test was approved and the plant would now be transported to the customer. Lewan: Neither Ny Teknik nor any other of the guests had any possibility to check the measurements made. The invitees could only observe the plant in operation for a few brief moments. Lewan: Rossi stated that an agreed contract research at the University of Bologna can now be initiated and that discussions on collaboration with Uppsala University can get started. Oct. 28, 2011 Rossi performs another test. (Images of diesel generator outside the building.) Test fails to show convincing evidence to support Rossi's heat claim. Oct. 28, 2011 New Energy Times publishes "Energy Catalyzer: Extraordinary Scams Require Extraordinary Claims." 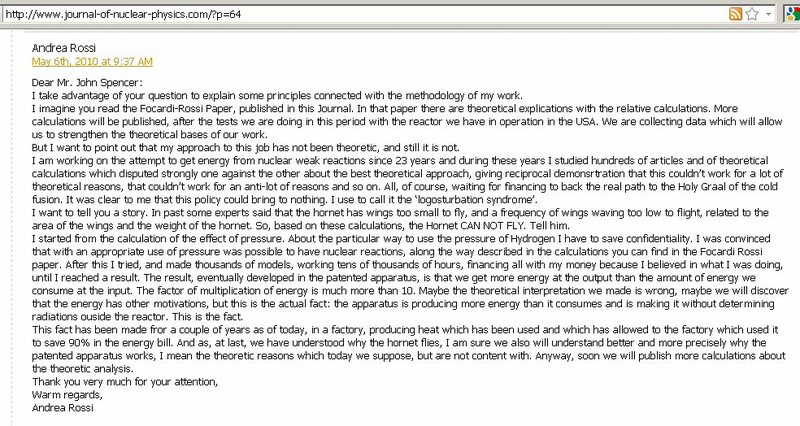 Oct. 21, 2011 Rossi writes on his blog: We enrich Ni 62 and 64 isotopes, but this is not an effect of the operation of the reactor. Oct. 15, 2011 Focardi speaks at TEDx Bologna. Oct. 11, 2011 Focus.It interviews Rossi. Raymond Zreick: Why limit the duration [of the tests to] three hours? Why not push it to 30 or 300?. Rossi: A public test cannot last 30 or 300 hours. As you have seen, we started at 9.30 and finished at midnight. More than that it is impossible to hold an audience. Oct. 10, 2011 New Energy Times publishes "Rossi’s 11th Demo, 11th Failure." Test fails to show convincing evidence to support Rossi's heat claim. Oct. 9, 2011 Brian Ahern writes to the CMNS E-mail list. Explains failure of Oct. 6 test. Test fails to show convincing evidence to support Rossi's heat claim. Oct. 7, 2011 Ny Teknik quotes Rossi: Within a few months the product will be on the market, and the best test is done by the customers who will come back with the product if it doesn’t work. Oct. 7, 2011 Ny Teknik quotes Rossi: We had a preliminary agreement with a very important party [Preston] in the U.S., but when we received the final draft, it included conditions that our lawyers said that we should not accept. Note: On Sept. 26 Rossi promised to run test for at least 12 hours. Oct. 6, 2011 Only one scientist goes on record to support Rossi claim: Roland Pettersson, retired analytical chemist from Uppsala University. Rossi had claimed "invited selected scientists from Sweden, USA, France, Great Britain, Germany, Italy, Greece, Japan, China, Russia" would attend Oct. 6 test. Oct. 6, 2011 Rossi performs another public test. Rossi chooses ambiguous steam and heat exchanger design rather than keep temperature below boiling. Rossi was widely criticized for making earlier set of claims based on steam enthalpy and he promised to make future measurements on hot water. Journalist Lewan takes the data by hand for Rossi. Test fails to show convincing evidence to support Rossi's heat claim. Oct. 6, 2011 New Energy Times publishes "NASA Won’t Confirm Relationship With Rossi." 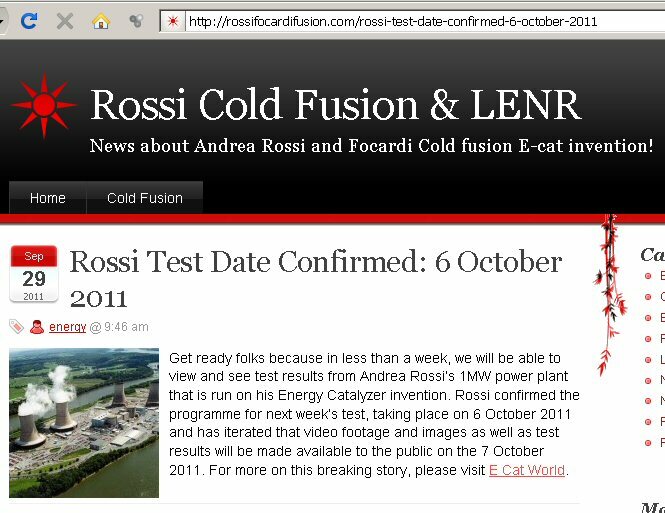 Sept. 29, 2011 E-Cat Web site quote about Rossi device: Get ready folks because in less than a week, we will be able to view and see test results from Andrea Rossi’s 1MW power plant that is run on his Energy Catalyzer invention. Rossi confirmed the programme for next week’s test, taking place on 6 October 2011 and has iterated that video footage and images as well as test results will be made available to the public. Sept. 29, 2011 Rossi denies that NASA observed failed Sept. 5 and 6 tests. Rossi states "Our relationship with NASA is totally positive." Sept. 28, 2011 New Energy Times publishes: "NASA Advances Evaluation of Piantelli’s LENR Research." The team went to Rossi's showrooom with an explicit agreement about test parameters and opportunities to observe and evaluate Rossi’s claims. They did not observe any positive results. 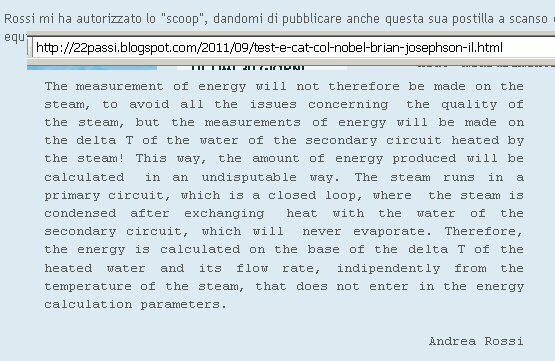 Sept. 26, 2011 22 Passi quotes Rossi: The measurement of energy will not therefore be made on the steam, to avoid all the issues concerning the quality of the steam, but the measurements of energy will be made on the delta T of the water of the secondary circuit heated by the steam! This way, the amount of energy produced will be calculated in an undisputable way. The steam runs in a primary circuit, which is a closed loop, where the steam is condensed after exchanging heat with the water of the secondary circuit, which will never evaporate. Therefore, the energy is calculated on the base of the delta T of the heated water and its flow rate, independently from the temperature of the steam, that does not enter in the energy calculation parameters. Sept. 26, 2011 Sterling Allan announces Oct. 6, 2011 Rossi test. Allan: Scientists to Test Cold Fusion E-Cat - Italian Inventor, Andrea Rossi, has invited scientists from around the world to perform an important test on his E-Cat cold fusion reactor on October 6th. Sept. 26, 2011 Rossi writes on his blog: We have invited selected scientists from Sweden, USA, France, Great Britain, Germany, Italy, Greece, Japan, China, Russia. Every component of the circuit will be inspected and weighed before the test, and also external measures will be taken of the reactors. The test will last at least 12 hours. Sept. 22, 2011 NASA LENR Workshop. NASA (Nelson) states that run-time required to prove Fat-Cat is two weeks, time to prove 1 MW plant is several months. Sept. 8, 2011 Rossi meets fourth potential customer/investor. Sept. 7, 2011 Rossi performs another test, just for Lewan. Unlike Sept. 6 test, device now shows outflow of steam and water. Test fails to show convincing evidence to support Rossi's heat claim. Sept. 5, 2011 Rossi Energy Catalyzer test for engineers representing Preston. NASA affiliates also present. Plumbing leak. Test fails to show convincing evidence to support Rossi's heat claim. Sept. 3, 2011 Xanthi Express reports that no application for approval of building fusion power nickel-hydrogen was ever filed. Sept. 3, 2011 New Energy Times publishes Rossi video interview. Sept. 2, 2011 New Energy Times publishes Passerini video interview. Sept. 1, 2011 New Energy Times publishes Bianchini video interview. 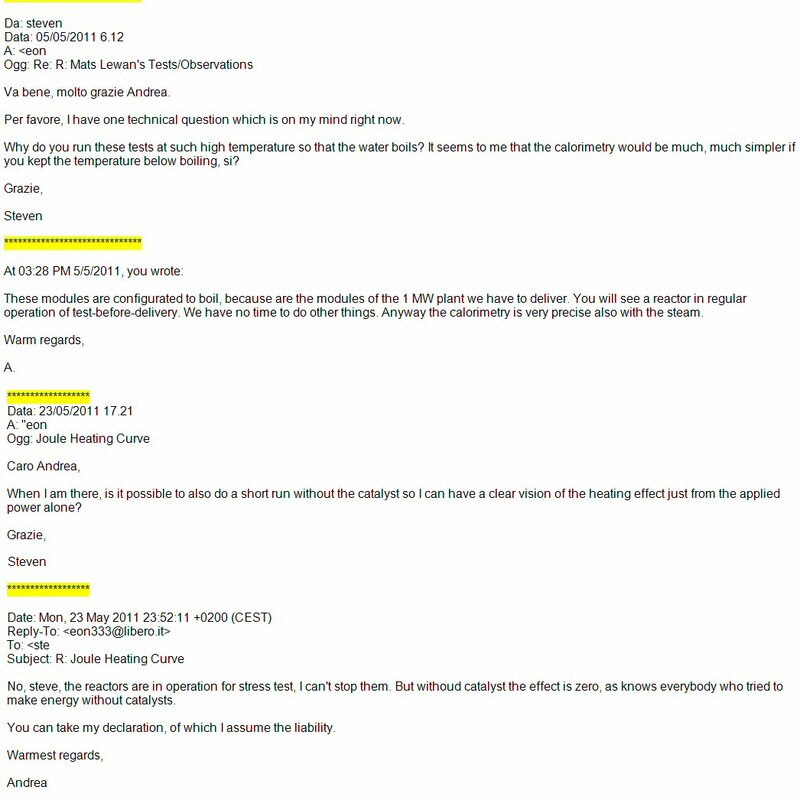 Aug. 28, 2011 Mats Lewan writes to Mitch Randall: "My method for verifying that there's no liquid water at the outlet is not very accurate. I'll have to investigate this further." Aug. 28, 2011 New Energy Times publishes "Rossi: The Scientific Verdict." Aug. 26, 2011 New Energy Times publishes Focardi video interview. Aug. 19, 2011 Rossi's fans believe him. 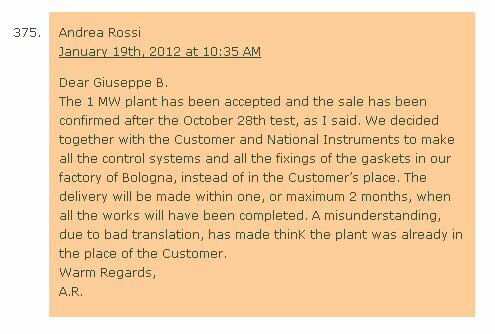 Aug. 18, 2011 Rossi writes on his blog: Since the 1 MW plant has been sold, it is property of our Customer, who is free to make all the tests he wants. We will continue our R&D with the Universities of Bologna, Uppsala. Aug. 18, 2011 New Energy Times publishes Levi video interview . Aug. 9, 2011 Rossi writes on his blog that his factory is in Miami. Aug. 8, 2011 Rossi writes on blog: reason of the split from Defkalion has been only and exclusively financial. Aug. 7, 2011 Lewan quotes Rossi: The launch will take place in the United States under an agreement that we signed last week with one of the most important entities [Preston] of the USA. It will be overseen by researchers at a very high level, but I cannot mention any names until after the launch. Aug. 7, 2011 Galantini writes third message about steam measurements. This one is dated July 25, 2011. Ny Teknik publishes on Aug. 7. Aug. 7, 2011 Rossi issues backdated (Aug. 4) press release announcing termination of business with Praxen/Defkalion. Aug. 7, 2011 New Energy Times publishes "Rossi’s Scientific Failure in Seven Steps." Aug. 5, 2011 New Energy Times publishes "Reviewing Ny Teknik Video: Did Rossi Play With Power Setting?" Aug. 2-4, 2011 Rossi meets with third potential customer, investor John Preston, the former director of MIT's technology licensing office and former chief executive office of Quantum Energy Technologies in Boston, MA. New Energy Times anonymous sources say that Rossi demanded $1.5 and soon thereafter, $15 million for the privilege of testing his device. Rossi upped the price after making the agreement. Aug. 2, 2011 Capiluppi advises Krivit of Capiluppi's backdating "mistake." Aug. 2, 2011 Edmund Storms, wrote an e-mail to his colleagues anticipating the commercial viability of Rossi's apparatus and promising to do everything he could to promote Rossi. Aug. 1, 2011 Deadline for first payment from potential customer/investor, Defkalion, to Rossi passes. July 30, 2011 Eddie Sines identifies serious flaws in Rossi's U.S. patent application. Sines: [Rossi] has shown a number of E-Cat devices on various Web sites. In each of these devices, he claims to be using 58g of Ni 62. Here's the glaring problem: Ni 62 is a rare isotope. Rossi's devices would be worth $582,000 each if they truly had 58 grams of highly refined Ni 62 within their case. July 30, 2011 New Energy Times publishes "Report #3." July 22, 2011 Michael Nelson of NASA discusses details of test protocol with Rossi. Rossi now informs Nelson that NASA, or a third-party must pay Rossi $15 million for the privilege of testing his device rather than Rossi paying NASA for a test. July 20, 2011 "Penny Gruber" writes: Rossi is a convicted serial fraud. His discovery is that with enough chutzpah, one can convince a number of people that an electric tea kettle is a new kind of nuclear reactor. July 19, 2011 Rossi fans focus attention on Krivit. July 18, 2011 Rossi fan writes on his blog: I would like to thank you for the efforts you are doing in order to improve our life and save our Planet. July 18, 2011 Rossi writes on his blog: I repeat: no more public tests will be made. 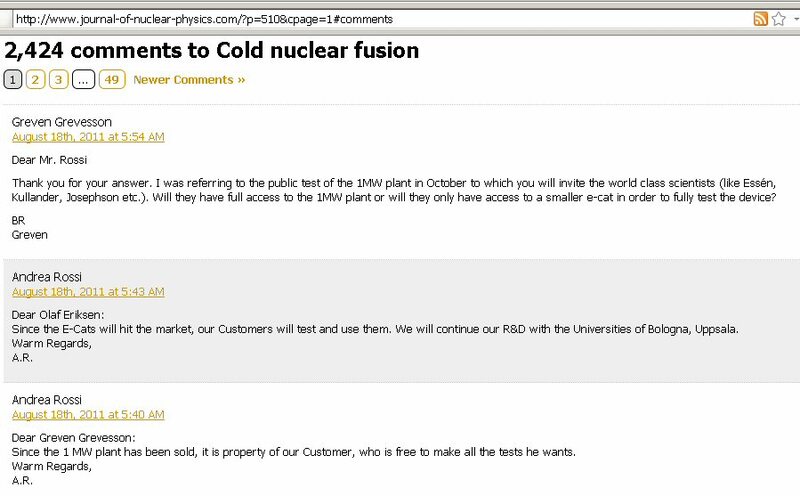 July 18, 2011 Rossi writes on his blog: We always said that no more public test would have been made before the start up of the 1 MW plant in October. All the tests we are making are not to be published and there are no substantial differences from the results already obtained. July 17, 2011 Rossi writes on his blog: We have presently plants working in the USA, in Italy and in other locations. July 15, 2011 Rossi writes on his blog that he and NASA will work together. Rossi: I met extremely high level scientists. I have been really surprised and honoured to discover that they have got indipendently throughly information about this technology. All I can say, so far, is that we will work together. July 15, 2011 Michael Nelson writes to Krivit. Nelson: Our impression of Rossi is that he is not acting like a man that doesn’t have something. Exactly what he has, we still are not sure. But he seems certain that he has something. July 15, 2011 Krivit interviews Essén. Krivit: In either your experience or your efforts to inspect perpetual motion claims, have you ever had anybody tried to claim anything on the basis of steam before? Essén: No, I can't recall that. I'm new at steam, unfortunately. Krivit: Do you have any training on steam quality or steam enthalpy? Krivit: For example, like knowing the 1,600 times expansion rate? Essén: I'd come across that before. I was aware of that. Krivit: When you pulled the hose out of the wall and saw the steam, did you think about the expansion rate? Essén: No, I must admit, I was thinking that I must check that the water is not draining out. I had this vague feeling that the water inlet flow wasn't that fast, that the steam could be consistent with it, especially after some condensation in the hose. But we should have looked more into that, obviously, but there was not enough time. July 14, 2011 Rossi visits NASA Marshall Space Center to discuss his device. NASA propulsion engineer Michael Nelson organizes a meeting. At the end of the meeting, Rossi asks whether NASA would like to independently test and confirm his device. NASA agrees. NASA tells Rossi that he must bear the costs of test, estimated at $50,000. Rossi agrees. NASA begins to draft a formal agreement. July 13, 2011 Rossi leaks the news of the forthcoming NASA meeting to one of his bloggers. July 12, 2011 New Energy Times reports that Uppsala University has no agreement with Rossi. July 11, 2011 EV World quotes Rossi. Rossi: In Miami we have a factory where we are preparing the reactors that will be the modules of the one megawatt plant that we are preparing for Defkalion in Greece, that will go into operation in October. 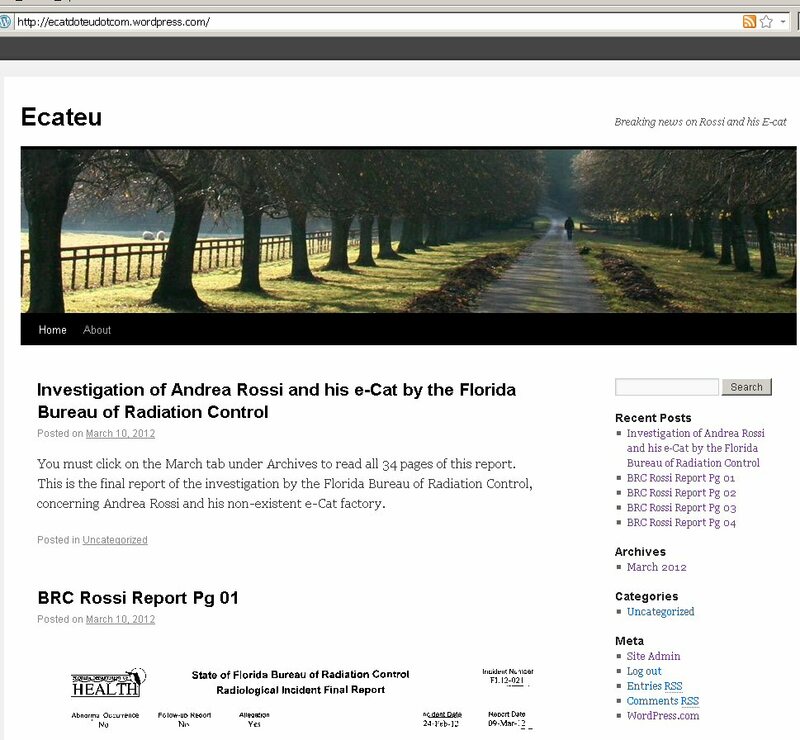 July 11, 2011 Rossi tells E-Cat Report Web site that an unsigned "co-operation agreement" was in place between Rossi and Uppsala University. July 8, 2011 Krivit speaks with Essén on the phone about his March 29, 2011, visit to Bologna. KRIVIT: Have you done any calculations on the velocity at which the steam should have been coming out? ESSÉN: No, but many people have done that. I have seen their calculations. KRIVIT: Are you aware that many people have calculated that the exit speed should be 50 to 100 km/h? ESSÉN: Sounds like a lot. No, I wasn’t aware of that. There was not a huge water flow going in, so, intuitively, it was consistent with the amount of steam coming out. KRIVIT: People who have made the speed calculations have written that the speed coming out of a 10mm hose of that length should be really fast; it should have sound and momentum. It doesn’t seem like you saw anything like that. Essén: So where did it go then? KRIVIT: Probably down the hose into the drain. ESSÉN: Down the drain? There was no drain. KRIVIT: Where was the hose going when you saw it? ESSÉN: In the room next to the E-Cat, going into a hole in the wall. July 8, 2011 Julian Brown visits Rossi garage in Bologna. July 6, 2011 Defkalion offers licenses for rights to manufacture "products based on Andrea Rossi’s e-Cat invention" for 40.5 million Euro per factory. opportunity, prior to issuing a public announcement, that we are accepting international expressions of interest through our website. July 5-6, 2011 Rossi visits professors in Sweden in attempt to arrange research agreement. July 3, 2011 Kullander announcement for public lecture at Orebro University. June 29, 2011 Tony Tether confirms that he saw a Rossi demo. June 29, 2011 SPAWAR researcher writes: I know that Tony Tether, former head of DARPA, saw a test, He said if it was a hoax, it was a damn good one. Folks at NRL saw a couple of tests. When they began asking questions, Rossi left in a huff. I also know of folks who have asked to see a test who have been turned down. June 28, 2011 New Energy Times publishes "Report #2 - Energy Catalyzer: Scientific Communication and Ethics Issues " Rossi's Energy Catalyzer patent claim contains imprecise diagram and conceptually resembles the much more detailed drawing of Piantelli’s device that appears in Piantelli’s 1995 patent application. Both devices are designed to use nickel powders that interact with hydrogen gas, and both use a fluid, like water, to carry produced heat away from the device’s reaction chamber. June 24, 2011 Nobel Laureate Brian Josephson produces video and promotes Andrea Rossi's E-Cat. June 24, 2011 Paolo Capiluppi writes to Krivit that he does not yet know if Rossi has countersigned the University of Bologna contract. 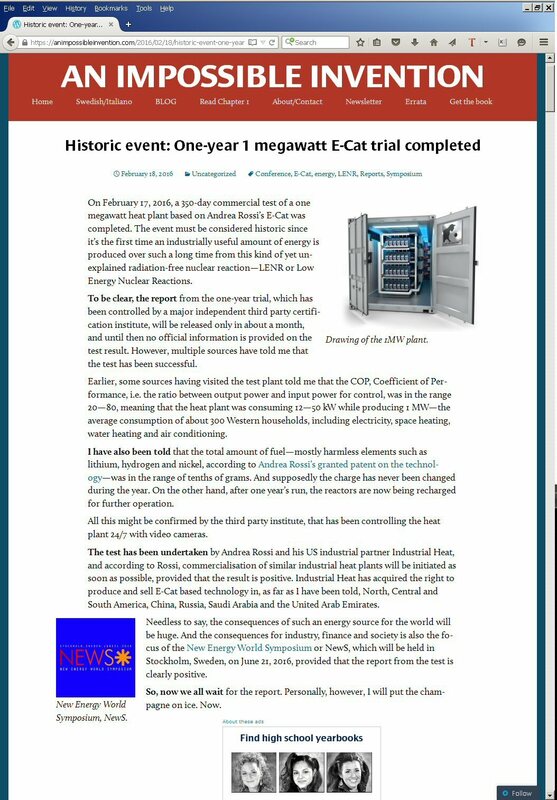 June 21, 2011 New Energy Times publishes "Report #1 - First Report of Interviews With E-Cat Trio." June 20, 2011 New Energy Times publishes "Galantini Sends E-Mail About Rossi Steam Measurements Today." June 20, 2011 Galantini sends Levi second message about steam measurements. Galantini clarifies that steam was measured by mass. June 20, 2011 Levi asks Galantini for more details about steam measurements. Levi asks Galantini to clarify that steam was measured by mass. June 20, 2011 New Energy Times publishes "Phone Interview with Sven Kullander." Steven B. Krivit: When you looked at Andrea Rossi’s Energy Catalyzer, did you have the opportunity to see the output directly from the outlet on the E-Cat or was the hose always attached to the outlet? Sven Kullander: There is a valve on the top that was open and we checked that the steam came out. Krivit: Was the hose connected to the outlet at the same time you checked the steam? Krivit: Do you know if the steam dryness was measured by volume or by mass? Kullander: I think it was measured by volume but I’m not sure. Krivit: What makes you think it was measured by volume? Kullander: Because I don’t see any mass involved, there is just volume quantities. It was a measuring gauge that was inserted inside. I could not see how that could be a mass measurement. Krivit: If you don’t mind, can I ask who paid for your travel expenses? June 18, 2011 Rossi writes on his blog: The 1 MW plant which we will start up in Greece in October will generate heat. For power we are not yet ready, but we made a very important step forward in this week, because our reactors now produce a totally dry steam (no more traces of water in the steam) and this is a step forward to couple the turbines. We have 300 reactors in operation now in our factory, and we are making exponential progress day by day. Note: Rossi states here that he had traces of water in steam before this week. He has contradicted himself from Jan. 25, 2011. June 18, 2011 Rossi writes on his blog: I do not care too much, they are either competitors, sometimes disguised as Research Laboratories anxious to validate, fake journalists sent by the same, or just honest sceptic who are not important for our market. Our universal credibility will come from our working plants that we will sell to our Customers. I leave to others, more supplied of free time, the burden to chatter of LENR, I have to make them, and I have not time to confront chatters. For example, we had recently a “fake” journalist here who wrote stupidities about the water in the steam: very good, my 300 reactors actually under stress tests are making steam without water, I mean perfectly dry steam, and they will go in operation not in my factory, but in the factory of our Customer: once my Customer has dry steam produced by a 1 MW plant do you think that the stupidities of a snake are worth something? In these days, together with the University of Bologna and with my Customers, we have made tests measuring not only dry steam, but also with really , really, REALLY high performances: they know, I know, we know. That’s enough. AGAIN : WE MADE THE MEASUREMENT OF THE WATER IN WEIGHT !!!!!! AND WE EXPLAINED THIS TO KRIVIT VERY WELL!!!!! AND HE GOT CONFIRMATION OF THIS FROM AN INDIPENDENT PROFESSOR HE CONTACTED !!!!! NOBODY MAKES THIS KIND OF MEASUREMENT IN VOLUME, BECAUSE IT IS A NONSENSE !!!!! KRIVIT SAID ” I HAVE UNDERSTOOD” WHEN I TOLD THIS DURING THE INTERVIEW. I HAVE MANY WITNESSES OF WHAT ABOVE ENCLOSED THE PROF. HE CONTACTED TO GET INDIPENDENT COUNSEL !!!!! BUT HE REPORTED THAT WE DID NOT UNDERSTAND THE PROBLEM: WE. PHYSICS PROFESSORS OF CERN, UNIVERSITY OF BOLOGNA, UNIVERSITY OF UPPSALA, UNIVARSITY OF STOCKOLM, WHO MADE THE TESTS!!!!! AND HE COMES HERE TO TESCH TO US PHYSICS!!!!!! THIS IS A SNAKE, NOT A JOURNALIST, AND I WOULD LIKE VERY MUCH TO KNOW WHO SENT HIM (I HAVE A PRETTY IDEA, THOUGH, SINCE HE UNADVERTEDLY GAVE US A CLUE). 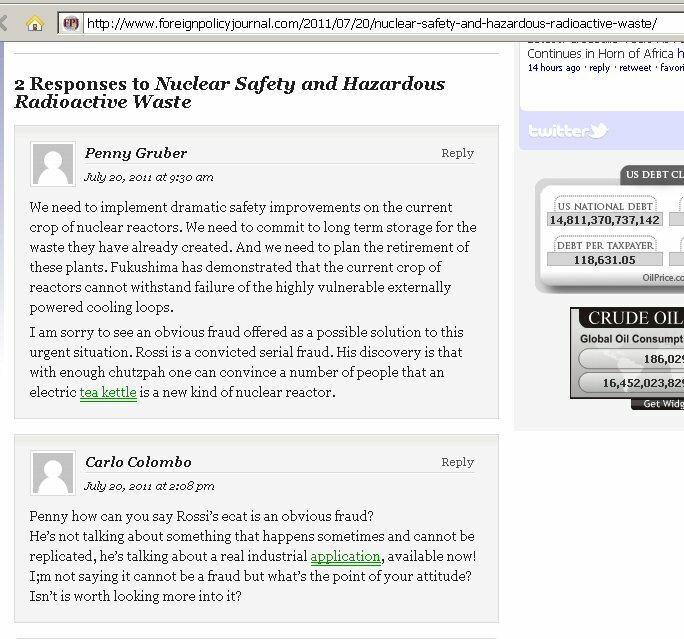 June 17, 2011 Rossi writes on his blog: Dear Maryyugo, We have already made enough public tests, either heating the water ( please go to read all our reports and papers on the Journal Of Nuclear Physics, or making steam. In this last case we always made the measurement of unvaporized water residue giving the result in mass. Our tests have been made with Professors of Physics working with the Universities of Bologna, Uppsala, Stockolm, with CERN, with INFN, and I think that only an imbecile can think that such Persons are not able to weight water in steam. We are receiving suggestions how to measure the water in steam, and this is like teach to a cat how to miew. By the way: the steam from the reactors which we are testing now, and that will compound the 1 MW plant, is dry. The steam during the interview of the clown of yesterday was totally dry. Of course, should be this not true, our Customers will be very angry: in that case, that will be an opinion which will be very important for us, while the opinion of our competitors and of their friends, for obvious reasons, have not much importance for us, if any. Now I have to make my 1 MW plant, then we will make other 1 MW plants for our Customers. That’s all we will do. Our Customers tests are the sole tests that count, for us. Therefore, I have absolutely not time for competitors anxious to test my Cat to make their “validation”. About the work that we will make with the University of Bologna and Uppsala, this will not be a public demo, but a work of Research and Development, made closed doors. 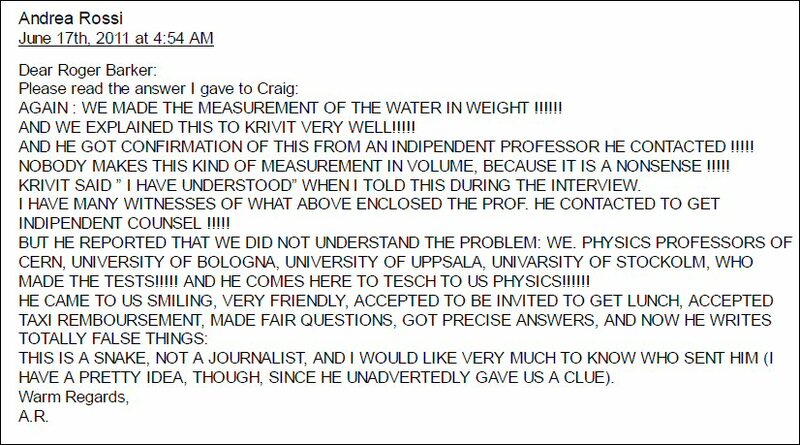 June 17, 2011 Rossi writes on his blog: Dear Craig, Mr Krivit has understood nothing of what he saw, from what I have read in his ridiculous report… This guy has seen for half an hour an E-Cat in the factory where we make many tests, made some questions to Prof. Levi, Prof. Focardi and me. Evidently has understood nothing, perhaps for the short time we gave him, also because we have to work: maybe he is angry because we had to send him away from the closed boxes and because we had to say him good bye shortly because we have to make our work. Prof. Levi has explained very well to him how the measures have been made and the importance of the issue. He has explained very well that the percentage of uncondensed water in the steam has been measured in weight (in volume is impossible, for various reasons), and he also got confirmation of this from a specialist from whom he has taken indipendent counsel. Nevertheless, he has understood nothing, or wanted not to understand, for reasons he better knows. Our tests have been performed by Physics Professors, who know how to make measures , and I am measuring the performance every day on 300 reactors. In any case we will start our 1 MW plant in october and we will see how it works. Of course I assure his considerations are invalid, but I want to say more: our products on the market will confirm this. Probably this journalist has been sent by someone that wants to dwarf our work. He also tried to blackmail prof. Levi, and Levi already has given to his attorney due information. 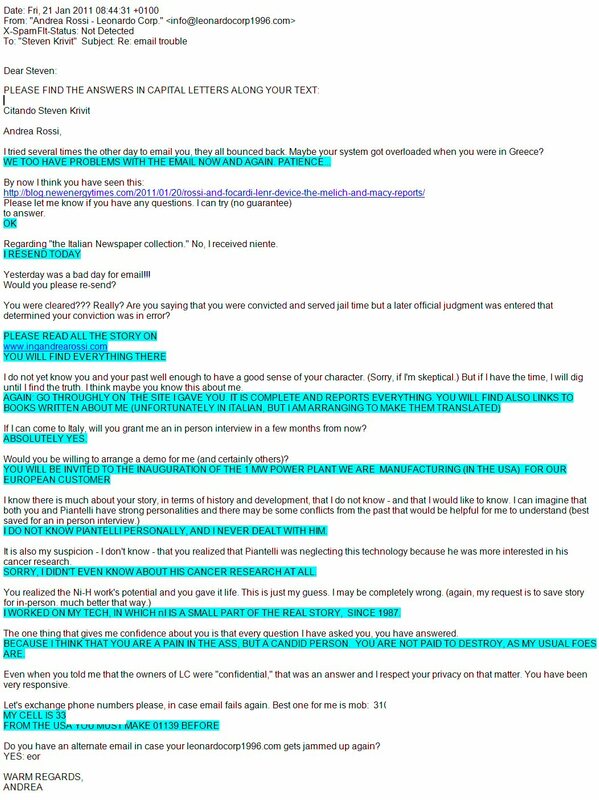 June 16, 2011 Rossi fan ask Rossi on his blog about Krivit's Preliminary Report. Craig: Dear Mr Rossi, Can you respond to the recent assertions by Steven B. Krivit that the method in which the steam may have been measured previously is potentially giving incorrect measurements of the power capability of the e-cat. potential impact.” I am hoping you can assure us that his concerns are invalid. June 16, 2011 New Energy Times publishes "Preliminary Report." Krivit is very critical about what he observed from the site visit, demonstration and interviews in Bologna. June 15, 2011 Krivit goes to see other LENR scientists in Napoli that evening. They ask for Krivit's evaluation. He shows them video of tiny puffs of steam coming from E-Cat. Their response: ROFL. June 15, 2011 After leaving Rossi's garage, Alex Passi asks Krivit for evaluation. Krivit says there may be serious problems. Passi immediately arranges meeting between Krivit and Levi to take place at a local restaurant, without Rossi. June 15, 2011 During video interview, Krivit asks Rossi how steam quality was measured. Rossi says that there is no technical report on the steam measurements. Rossi: I must emphasize that [Focardi] does not know how the reactors is built, so the issue of pressure, of pressure control, was not an issue regarding his research. Krivit interviews Rossi and asks about his moment of discovery. This was the first time any journalist had asked Rossi this question. Krivit: There must have been some point at which you saw something that you said, 'Wow! This is strange.' Do you remember that moment? Rossi: Yes, because I burned a finger. Krivit: Can you tell me more about that moment? Rossi: Yes, uhh, because, umm, I was, uh, uh, working with a, with a small reactor which was made of, uh, umm, of copper, was made of copper, uh, and with a small lead shielding, and I was giving energy with a resistance, uh, giving, eh, some sort of temperature. At a certain point, the, the temperature raised very suddenly, and, uh, and I had in my, the, the, uh, left finger of, uh, of, uh, the, the, the, the finger of, umm, uh, the index of my left hand, umm, sit on a, a part of this small reactor which was as big as this, and I burned the top of the finger. June 14, 2011 Krivit interviews Levi and asks about Jan. 11, 2011 press release. Krivit: You organized that [Jan. 14, 2011 press conference and demonstration] - I think I have the correct press release. Is this the correct press release — ? Levi: I have written that. And also it was revised by our department director [Capiluppi] because it is a press release of the department of physics. Levi: So it was released as an official communication of our physics department. Our director was always informed - Professor Capiluppi - was always informed of what was going on, and also professor Zoccoli was present and - he is actually the director of INFN section of Bologna, National Institute of Nuclear Physics, he was also informed. June 14, 2011 Krivit interviews Levi. Krivit asks Levi how steam quality was measured. Levi says that Rossi has a technical report on the steam measurements. June 14, 2011 Krivit interviews Focardi. Focardi states that the only place he and Rossi submitted their paper was to arXive. June 14, 2011 Krivit interviews Focardi. Before beginning, Focardi tells Krivit he has difficulty with English and asks Rossi to bidirectionally interpret for him. Note: Focardi gave interview in English to Ecat.com on Oct. 6, 2011; he was eloquent and in nearly perfect command of English. June 14, 2011 Krivit observes Rossi demo. Films steam exiting from Energy Catalyzer. Immediately films Rossi explaining his calculation of energy of the steam. Demo fails to show convincing evidence to support Rossi's heat claim. Note: Visual evidence contradicts Rossi's claim. June 14-15, 2011 Krivit visits Rossi in Bologna in his garage in the back of Rossi Brothers tire repair shop. Lewan quotes Maddalena Pascucci, identified by Rossi as his wife. Pascucci: The contract [with Defkalion] can be defined by two basic steps. The first is an experimental test. If the test goes well, there will be an initial down payment. Note: On Aug. 1, the initial payment was not made. June 10, 2011 Lewan writes: ... the first known European manufacturer of the device, in Greece – Defkalion Green Technologies – where a pilot installation of one megawatt will be inaugurated in October 2011, according to Rossi. Lewan writes: In a report in the Italian news channel Rai News in May 2011, Alexandros Xanthoulis, representing the owners, stated that the total investment required for covering Greece and the Balkans amounts to around EUR 200 million, but the identity of the investors remains unknown. Lewan writes: An agreement should grant Defkalion exclusive rights to produce energy catalyzers in Greece, Cyprus and the Balkans including Romania and Bulgaria, and first refusal rights to distribute them all over the world except in the USA and for military purposes. Note: Lewan portrays Defkalion as licensee of E-Cat. A month later, on July 6, Defkalion presents itself as a licensor, offering sales of international licenses for rights to manufacture "products based on Andrea Rossi’s e-Cat invention." June 10, 2011 Lewan writes statements, in the absence of scientific data, that are intended to build public confidence in the Energy Catalyzer. Lewan: Like Rossi’s U.S. partner, the company Ampenergo, Defkalion claims to have verified the function of the energy catalyzer. Defkalion spokesman Symeon Tsalikoglou: Yes, we have conducted and witnessed several tests on e-cat lab prototypes and have recorded favorable and encouraging results from the very first one. Several other industrial prototype-related tests have already been conducted and more are scheduled in the coming months. June 2011 Krivit makes multiple e-mail and phone attempts to contact Levi and Focardi to arrange interviews with them. Levi and Focardi do not respond. Rossi responds and manages Krivit's interview requests on their behalf. Storchi: I checked as requested with Physics Department (I copy in this email the Department's Director, Prof. Paolo Capiluppi) and I can confirm there's no an official press release of the Department (nor of the University). The press release you sent me (may I ask you where did you find it?) 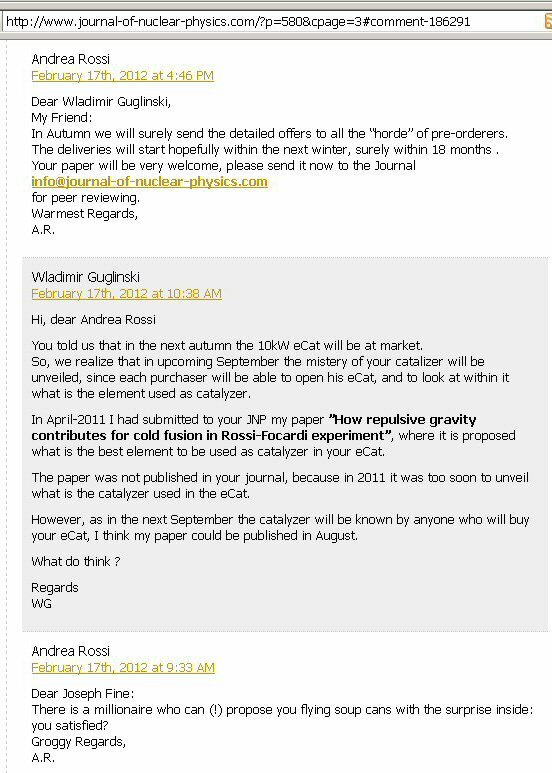 is a personal message of Focardi-Rossi, an invitation to the January experiment. We don't handle or have any info about it. June 8, 2011 Krivit asks Storchi for original copy of Jan. 11, 2011 press release. June 8, 2011 University of Bologna (Simona Storchi) comments on Jan. 11, 2011 press release written by Levi. Storchi: The press release you found online was made by Physics Department. June 6, 2011 Rossi writes on his blog about his plan to protect his intellectual property. Rossi: [I am] engineering a system that will destroy automatically the confidential parts if the reactor is open[ed]. June 6, 2011 Rossi and Krivit discuss data for the 18-hour Feb. 10-11 test. Rossi tells Krivit that he doesn't have the data, but that he is sure that Levi has the data. June 5, 2011 Rossi tells Krivit he has sold 1 MW plant to San Francisco customer. Ahern identifies as Bob King and that sale did not go through. May 26, 2011 Rossi takes over e-mail conversation about power measurements from Levi. May 25, 2011 Krivit asks Levi for power measurement data. 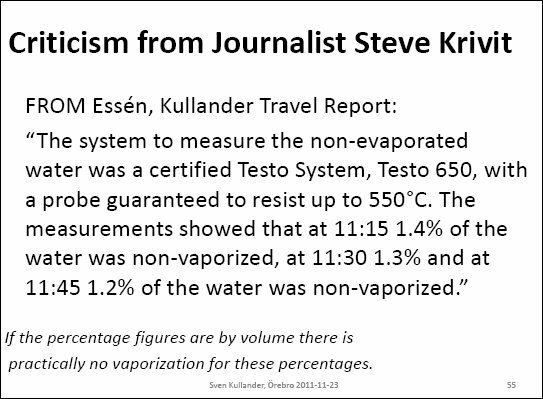 Levi says to ask Essén and Kullander: "This was their test and they have analyzed the data so please refer to them." May 24, 2011 Rossi writes on his blog that his is an expert with thermocouples. Rossi: I know very well the thermoelectric issue, because I made a patent exactly for high temperature T.E. I worked for years, from 1996 through 2000 and this field, and applied them to engines, power generators, boilers, I worked for DOE and DOD in this field, through LTI. I made with my hands thermocouples with a very particular directional fusion I had invented, obtaining a 100 Watts set very, very good tested in the University of New Hampshire in 1998. Krivit: When I am [in Bologna], is it possible to also do a short run without the catalyst so I can have a clear view of the heating effect just from the applied power alone? Rossi: No, Steve, the reactors are in operation for stress test. I can't stop them. But without catalyst, the effect is zero, as everybody who tried to make energy without catalysts knows. You can take my declaration, of which I assume the liability. Warmest regards. Note: When Krivit arrived, he saw one reactor running on the bench and three devices sitting next to it, idle. 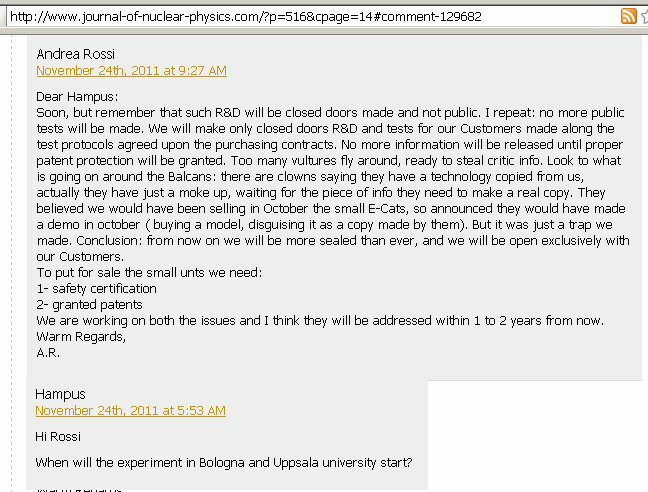 May 18, 2011 Rossi writes on his blog: We will not make any other validation test after the ones we already did. From November, our products will be on the market. Lewan: Have you paid anything to Rossi yet? Cassarino: Let’s put it like this, it was an important piece of the equation. May 16, 2011 Lewan writes news story about Rossi's colleagues who have formed a new U.S. company, Ampenergo. Lewan, in association with quotes from an Ampenergo representative, creates appearance that Ampenergo has performed due diligence on Rossi's Energy Catalyzer and that Ampenergo has consequently invested substantial cash to develop and/or promote the Energy Catalyzer, in the United States. May 16, 2011 Rossi and Ampenergo create the appearance that Ampenergo is the first customer and investor of Rossi's device. Angelo Saso (RAI): The fuel that the device is using is made of nickel and hydrogen. In 24 hours, the device uses one gram of hydrogen and in 180 days, uses about 50 grams of nickel. From an economical point of view, how much does it cost? Rossi: Well, I don't know how much one gram of hydrogen costs, maybe one cent of Euro and 50 grams of nickel costs 50 cents. Levi: We conducted our measurements, we repeated them, we checked that there were no hidden wires and batteries. Now, all the experimental evidence points out that the device is working. Angelo Saso (RAI): How did you figure out the idea of this secret additive? Rossi: Well, it was ten percent intuition and 90 percent perspiration. I mean I tried thousands of reactions and thousands of different combinations until I found the one that worked. Xanthoulis: There's a group of investors [inaudible] about ten names, which I'm not allowed to say, and they come from different parts of the world. David C. Aurel, Defkalion Green Technologies (Greece) CEO: The company is founded by a group of non-governmental entities. It's not just private investors but there are entities also in industry but non-governmental and international. Angelo Saso (RAI): How much money will be invested in the [Defkalion/Rossi] project? Alexandros Xanthoulis, board member of Defkalion Green Technologies (Greece) and shareholder of Praxen Defkalion Green Technologies (Cyprus): To cover Greece and Balkans, we estimate about 200 million. We believe that Greece will be [inaudible]. I believe it [Rossi's Energy Catalyzer] 100% and our investors believe in it 100% and of course if you see the messages we are getting, from all over the world, they believe in it 100%. There are several countries who are already requesting to work and buy the product from us. May 5, 2011 Angelo Saso (RAI News TV): In Greece there’s a company ready to bet on it 200 Millions euros, in the United States the industrial production is allegedly already started and there’s a plan to put the device on the market later this year. May 5, 2011 RAI TV broadcasts "The Magic of Mr. Rossi." May 5, 2011 Rossi response to Krivit questions. Krivit asks Rossi why he doesn't do water-based calorimetry. Rossi says the reason is that the devices are configured to boil. Krivit asks Rossi if he can observe a control test. Rossi says all "reactors are in operation for stress test, I can't stop them." May 4, 2011 Focardi speaks at University of Pavia seminar: "Il Ritorno Della Fusione Fredda." May 3, 2011 Krivit asks Rossi a second time for a schematic. Rossi assures Krivit he will see reactor in operation. May 2, 2011 New Energy Times: "Lewan Investigates and Observes Rossi Device: Ny Teknik journalist measures historic levels of excess heat in LENR device"
May 2, 2011 Ny Teknik publishes: "Ny Teknik tested the energy catalyzer"
April 29, 2011 Piantelli states to European Patent Office that Rossi patent application is not patentable: "It is apparent that the present application aims to patent an embodiment of the same invention as disclosed in 1995 by Piantelli, Focardi, and Habel, without adding special features." Claudia Daconto: What was not present during the experiment? Zoccoli: Basically, myself and others, we would like to look inside the machine, we would like to make measurements longer than for three quarters of an hour, to operate the equipment for two weeks and longer in order to verify that the production of heat is actually as claimed and is constant." Daconto: At that point, in fact, what would change for you? Zoccoli: What we can say that the fact that it produces so much energy for a long time cannot be explained, for example, by a simple chemical reaction. The fact is that there are many different ways to produce energy in three-quarters of an hour. An important test is given by the length of the energy production: if it goes on for a long time then probably it is not a chemical reaction but it is something different. April 28, 2011 Lewan operates test and takes data for Rossi. Lewan publishes data for Rossi and publishes news story for Rossi. April 22, 2011 Panorama quotes Focardi. Focardi: Though I should not be the one to say, this is the biggest scientific discovery in the history of mankind. Focardi:[The Jan. 14, 2011 demo used a] starting energy of 1 kilowatt and later, after a few minutes [input went] down to 400 watts to produce useful energy gain of 14 Kw, 31 times higher than the electricity input." Focardi:31 is not the maximum factor that we have obtained, in other experiments we have obtained 200. April 19, 2011 Lewan operates test and takes data for Rossi. Lewan publishes data for Rossi and publishes news story for Rossi. April 18, 2011 Journalist Lewan operates test and takes data for Rossi. Lewan publishes data for Rossi and publishes news story for Rossi. 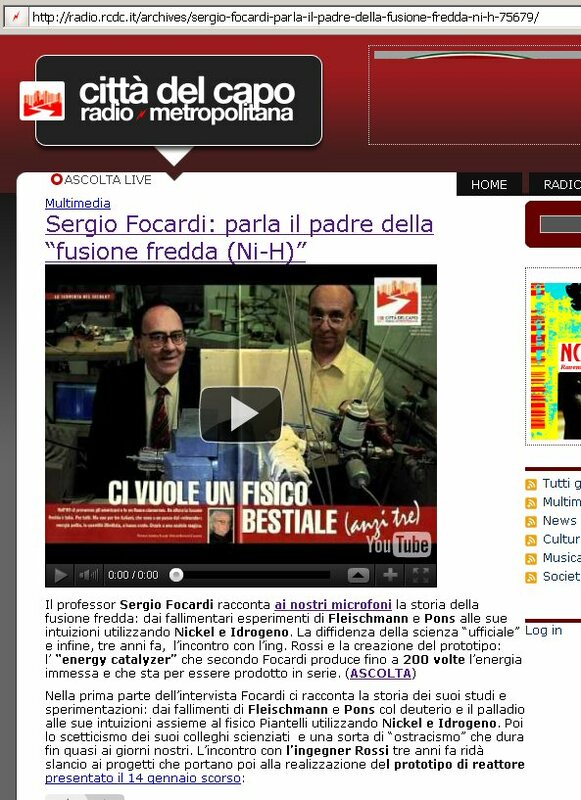 April 14, 2011 Radio Città del Capo news headline: "Sergio Focardi, the father of “Ni-H Cold-Fusion." Note: Attribution is wrong, should be attributed to Piantelli, the man to Focardi's left in the image. April 11, 2011 Rossi writes on his blog: "We have invented a process of ours to enrich Ni without relevant costs." 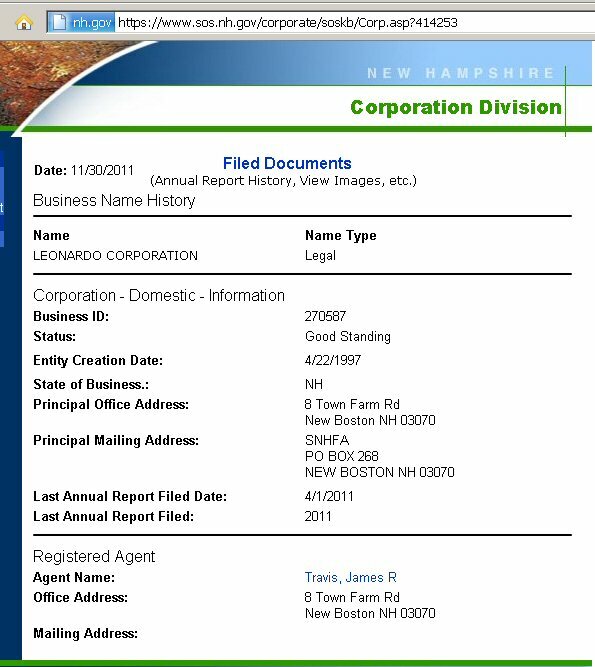 April 6, 2011 Craig Casserino files Ampenergo application for foreign corporation in New Hampshire. April 4, 2011 Craig Casserino signs Ampenergo application for foreign corporation in New Hampshire. April 3, 2011 Lewan publishes Hanno Essén and Sven Kullander's report. They conclude Rossi's Energy Catalyzer claims are valid. "The only alternative explanation is that there is some kind of a nuclear process that gives rise to the measured energy production." April 1, 2011 Leonardo Corporation still active in New Hampshire. Express: [Defkalion] is investing €200 million. The company has secured all necessary permits both in terms of product safety and standard requirements for the creation of an industrial unit, the company has purchased an old factory which is already transformed into a new unit which will be energy independent using the same products. Note: Stremmenos' relationship with Focardi goes back many years. Defkalion's first payment was due to Rossi on Aug. 1, 2011; it was not made. No permits were ever issued, see Sept. 3, 2011. March 11, 2011 Lewan quotes Rossi: All the money spent up to now has been my money. Furthermore: we are not searching venture capital, we want to sell our energy, taking upon us all the risks, we are paying for all the R&D activity, we are not asking money from anyone. Our Customers pay money only after successful testing of our E-Cats: the money, in case of plants sale, remains in the Customer´s escrow account until successful testing is made. So any stupid trick could only damage ourselves, not the customers. March 10, 2011 Lewan quotes Rossi: The 500,000 Euros I am paying to the University of Bologna is my last money, but when I deliver the one-megawatt plant to Defkalion I get cash back. From then on, 50% will be used for expansion and 50% to treat children with cancer. I will personally look for the children whose families cannot afford their care. March 10, 2011 Lewan quotes Rossi: I am assuming all the risks. No one is risking any money except me. 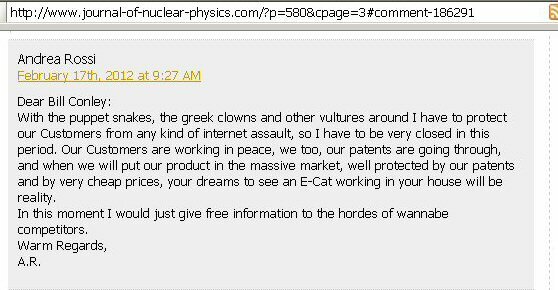 March 10, 2011 Lewan writes "Not even Defkalion Green Technologies, the Greek company that is building a first, one-megawatt test installation in Athens, Greece, has so far contributed with investments." March 10, 2011 Lewan writes that Rossi "is now paying 500,000 Euros to the Physics Department of Bologna University, following a new agreement." Note: Neither Rossi nor the university had signed an agreement at this time. Rossi never paid anything to the University. Feb 23, 2011 Lewan interviews Hanno Essén and Sven Kullander about Feb. 10-11, 2011, Energy Catalyzer test. Headline reads: "Cold Fusion: 'You Have to Embrace This.'" Kullander: "Well, I think they used a fairly scientific approach. But above all that they have heated a building and have done so for one year (according to Rossi), and have run the experiment for ten hours without any electricity other than 80 watts to power the instruments." 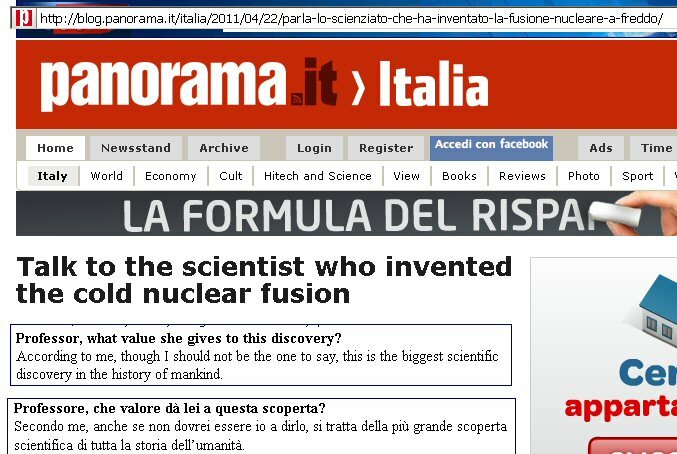 Feb 23, 2011 Lewan reports on Rossi and Levi: "In the morning of February 10, the inventor and engineer Andrea Rossi initiated a new controlled experiment in Bologna...With him was the physicist and researcher Giuseppe Levi from the University of Bologna, who also supervised the public demonstration in January. Together they ran the unit for 18 hours." Note: Rossi's "engineering degree" is from a diploma mill that was shut down for fraud. Feb 23, 2011 Lewan reports on the Feb 10-11, 2011, Energy Catalyzer test. Lewan writes that experiment was performed at the University of Bologna. It was not. It was performed in the empty garage behind the Rossi Brothers tire repair shop. 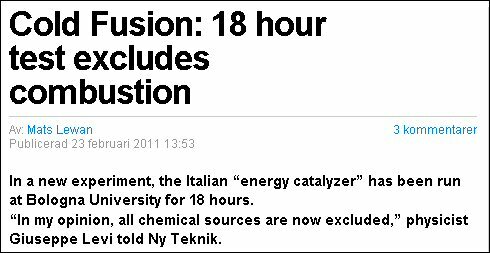 Feb. 23, 2011 Ny Teknik publishes: "Cold Fusion: 18 hour test excludes combustion"
Feb. 14, 2011 Rossi produces a document that verifies his degree in Philosophy from the University of Milan. New Energy Times verified the document directly with the University. 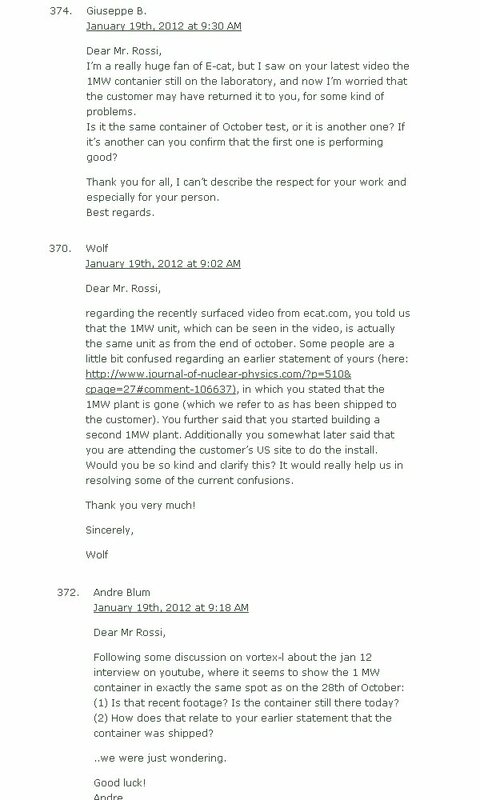 Feb. 7, 2011 Rossi states on his blog: "AS I DID, WITH YOUR MONEY, WITHOUT ASKING FOR FINANCING." Feb. 7, 2011 Lewan quotes Rossi and implies that Rossi is not seeking funding. Rossi: We are fully funded by our customers. Lewan: Defkalion Green Technologies [doesn't] seem to seek funding. Feb. 6, 2011 Presenters discuss Energy Catalyzer at ICCF-16 conference. Francesco Celani presents his second report. Bill Collis tells attendees that Defkalion is investing €200 million with Rossi. 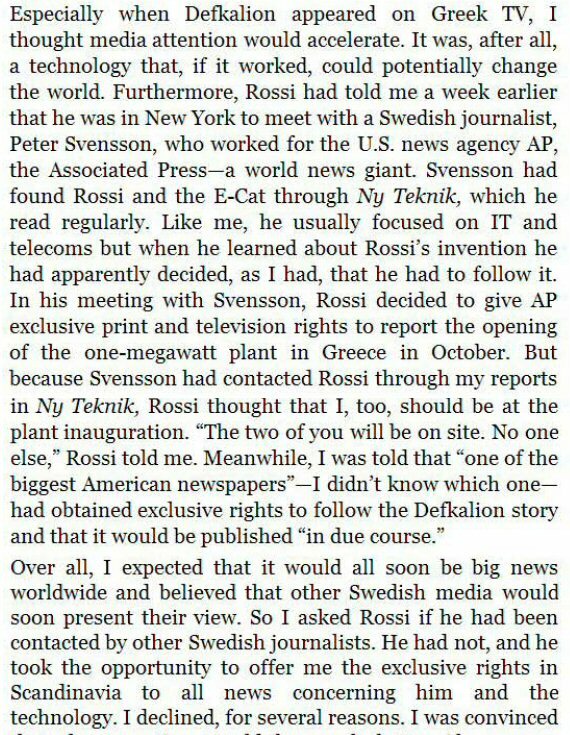 February 2011 Peter Svensson, a Swedish reporter with the Associated Press in the U.S., learns about the Rossi device from Lewan's news stories. Feb. 2, 2011 Lewan quotes Focardi about the Energy Catalyzer "discovery." Focardi: I believe, forgive me if I say it, that this is the greatest discovery in human history. For the results will be immense: clean energy at (almost) zero cost. Lewan: Do you think it will be rewarded the Nobel Prize? Focardi: If they award us the Nobel Prize, I think it would be well deserved. But that’s not what interests me. You know, rewards are something I usually give myself. Feb. 2, 2011 Lewan quotes Focardi, discussing his earlier work with Piantelli. Focardi: We got modest results – not as big as now – that we published, while those who continued with palladium and deuterium never saw anything at all. Lewan: Though not even Focardi knows exactly how Rossi’s apparatus is constructed, he is convinced of its importance. Lewan: Rossi is the sole constructor of the unit. 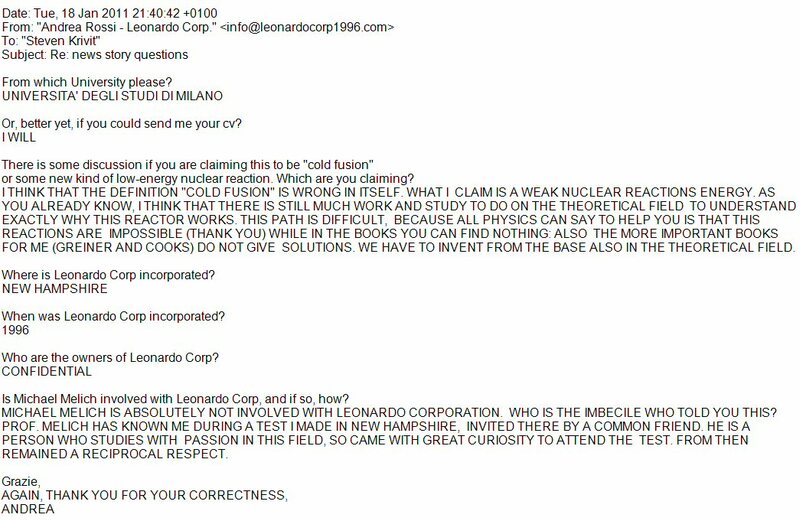 Only he and those working on building the reactors at the company Leonardo Corporation’s facilities in Miami, FL (Leonardo Corporation was founded by Rossi in 1997) know exactly how it is designed. The secret lies primarily in materials acting as some kind of catalysts. Feb. 2, 2011 Lewan writes about Jan. 14, 2011, Energy Catalyzer press conference. Lewan: The demonstration of the ‘energy catalyzer,’ as Rossi prefers to call it, was made in Bologna on the 14th of January, 2011, under the supervision of independent scientific representatives of Bologna University. Lewan: Rossi admits that the demonstration with a ‘secret bottle’ created much uncertainty. Rossi: Therefore, I would have preferred to wait. Lewan: It seems instead to have been Rossi’s scientific adviser over the past four years, Professor Sergio Focardi, who wanted to show off the results. Focardi: 'I would have done it earlier. You know, when you achieve results it is gratifying to spread the word on them. Moreover, I am 78 years old and cannot wait that long. 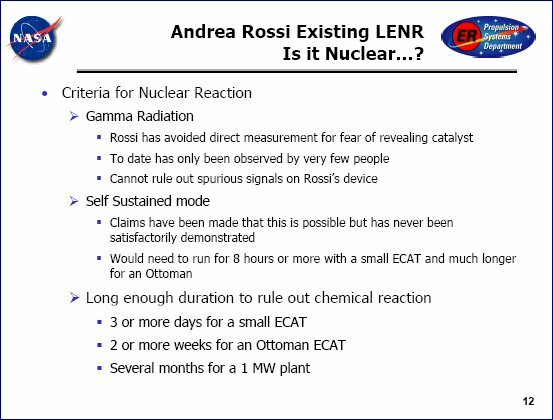 Feb. 2, 2011 Lewan quotes Rossi: Here in the factory in Miami, we have one hundred reactors like the one we showed in Bologna, almost ready. The problems now have to do with authorization, but I expect that the heating plant in Athens will be inaugurated in September or October 2011. Feb. 2, 2011 Lewan reports that Swedish physicist Hanno Essén thinks his July 14, 2006, theory may explain Rossi's Energy Catalyzer. 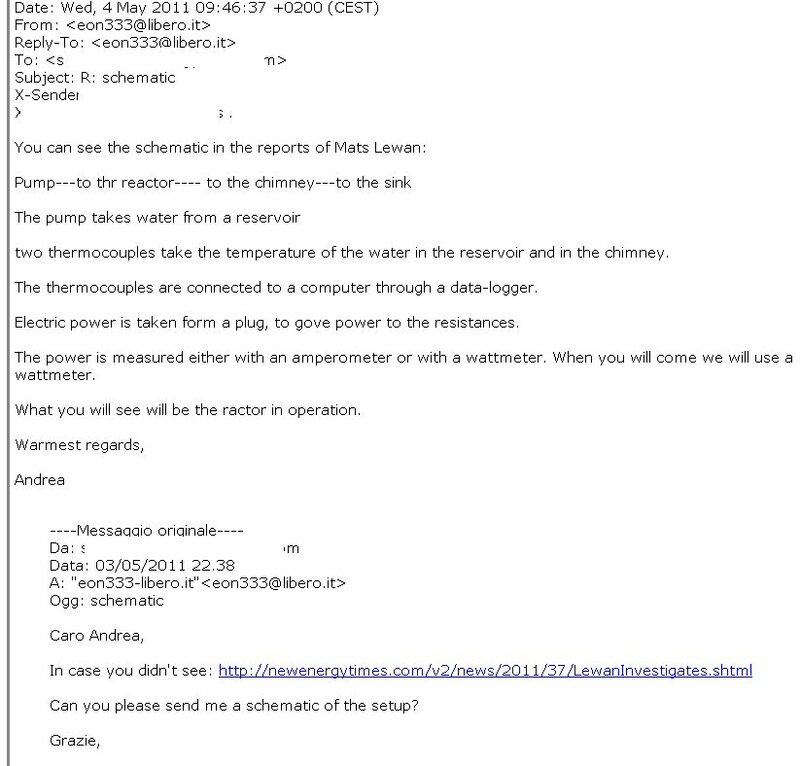 Jan. 31, 2011 As shown in the Feb. 6, 2011, Celani report, Rossi sends an mail to the CMNS community in which he writes that on Oct. 15, 2011, he will show a working reactor able to give a net heat output of about 1 MW. The power reactor will be made by assembling, in series and parallel, 100 modules of 10 kW each, similar to that shown at Bologna. Jan. 31, 2011 Krivit asks Rossi about Jan. 14, 2011, Energy Catalyzer press conference. Krivit: What was your objective to hold a public demonstration and seek media attention? Rossi: I had been requested from many sides to make this. I thought this could be useful. We are close to put in the market our product, and this has prepared the consequent necessary communication work. Jan. 26, 2011 University of Bologna professor Mauro Villa publishes gamma report on JONP of his evaluation of Rossi's Jan. 14, 2011 Energy Catalyzer demonstration. Jan. 25, 2011 Rossi responds to Celani in e-mail to multiple parties. Rossi: WE ALWAYS WORKED WITH WATER, NOT STEAM, IN THE FORMER TESTS WE MADE ALL THE WORLD AROUND. WE ALSO USED AIR. ALL THE DATA COINCIDE. I BELIEVE IN THE WORK OF DR GALANTINI, WHO SAID THAT THE STEAM WAS DRY, BECAUSE I AM PRETTY CONVINCED THAT HE IS ABLE TO ESTABILISH IF A FLOW OF STEAM IS DRY OR NOT. IN ANY CASE: THE AMOUNT OF ENERGY AT THE OUTPUT SHOULD BE OBTAINED ALSO IF AT 102 CELSIUS DEGREES WE HAD JUST WATER ( WHICH IS IMPOSSIBLE), NOT STEAM. I MEAN: IN THE WORST IMAGINABLE SCENARIO WE GOT OUR STRONG SURPLUS RESPECT ELECTROCHEMICAL PRODUCTION. THIS IS JUST A CALCULATION BY ABSURD, BECAUSE THE STEAM WAS DRY, AS CALCULATED BY GALANTINI. AND: WE WILL SEE IT BETTER IN THE PLANTS THAT ARE GOING TO BE PUT IN INDUSTRIAL OPERATION. 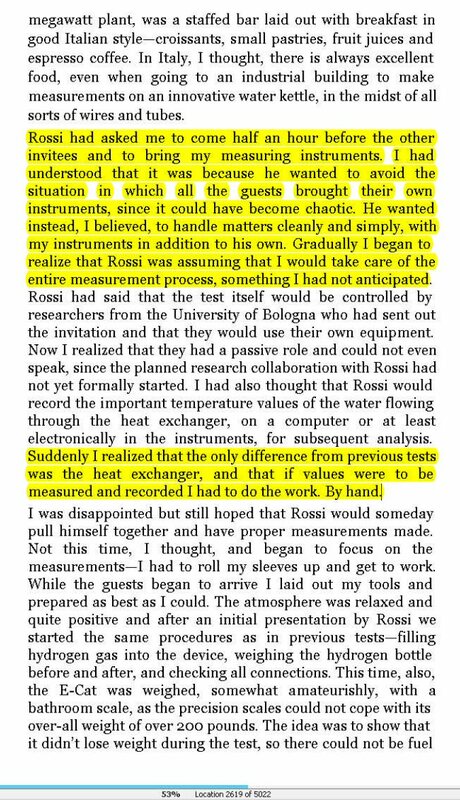 Note: There is no evidence to support Rossi's claim that he ever performed tests below the boiling point and used standard flow calorimetry. Rossi's comment about using "air" makes no sense. Galantini used a device that was incapable of measuring steam dryness. Jan. 25, 2011 Celani writes about vapor/liquid problem. Celani: The key point of the measurement is the assumption that ALL the water heated by the reactor went outside the cooling coil as *VAPOR*, NOT WATER. Note: Between Carbonelle (Jan. 18) and Celani, they identified the key concerns that would later lead to an identification of why Rossi's claim was invalid. Jan. 24, 2011 Celani notifies CMNS list, Rossi, Focardi, Galantini, Srinivasan and Takahashi that he has received 50 e-mails from people who mention the possible source of errors in the Energy Catalyzer demonstration. Celani announces that ICCF-16 organizers have, at the last minute, inserted two talks on the Rossi Energy Catalyzer device. Jan. 24, 2011 Krivit sends e-mail to Srinivasan and the ICCF-16 scientific committee and criticizes them for their "highly irregular" decision. Jan. 24, 2011 Mahadeva Srinivasan, chairman of the 16th International Conference on Condensed Matter Nuclear Science, decided to include presentations on the Rossi demo two weeks before the Feb. 6-10, 2011, conference. Jan. 21, 2011 University of Bologna professors Levi and Bianchini publish energy and radiation reports on JONP of their evaluation of Rossi's Jan. 14, 2011 Energy Catalyzer demonstration. Jan. 21, 2011 Krivit requests in-person interview with Rossi and demo for early summer. Rossi enthusiastically agrees. Jan. 20, 2011 Gilberto Galantini, a chemist hired by Rossi, sends his first e-mail about steam quality measurement. He writes that on Jan. 14, 2011, he had measured the steam. There is no prior evidence that either Rossi, Focardi or Levi had performed or commissioned any such test. As New Energy Times readers identified several months later, the model of the test device Galantini used was the wrong instrument and it was incapable of measuring steam quality. Jan. 19, 2011 Marianne Macy, Melich's wife and a contributing writer for Infinite Energy magazine, writes a report on the Jan. 14, 2011, test, and Rothwell uploads it to LENR-CANR.org on Jan. 20, 2011. Macy writes that the Rossi device produces 12 kW of excess heat. Macy quotes Levi, who assures her that the water put into the system is completely vaporized. Jan. 18, 2011 Scott Chubb writes on CMNS list about Rossi claim. Chubb: How pure was the H2 gas? Magnetic effects and even a small amount of D2 could initiate the effect. The failure to monitor D2 in these experiments continues to be a question that has to be resolved. 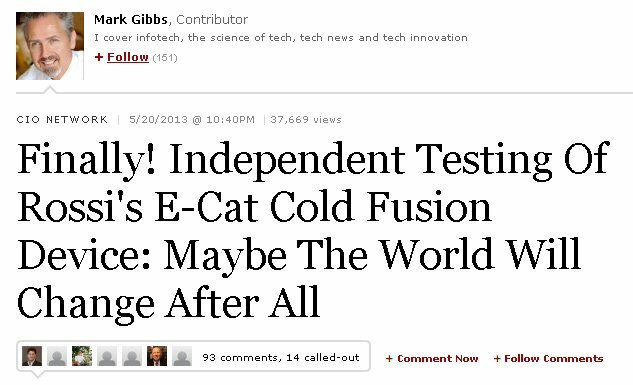 Note: Chubb fought for decades for his explanation of "cold fusion": D+D-->4He. He was grasping at straws to preserve the relevance of his theory in light of the Ni-H work. Jan. 18, 2011 Pierre Carbonnelle writes to Celani on CMNS list. 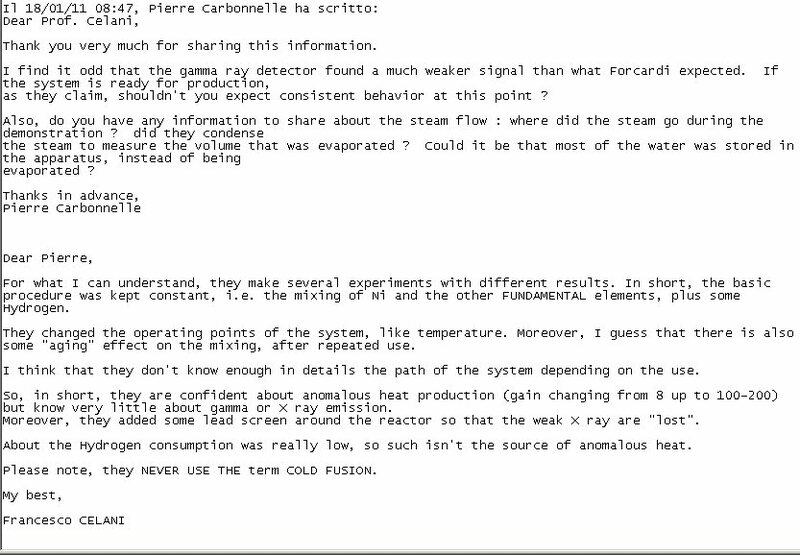 Carbonnelle: Do you have any information to share about the steam flow: where did the steam go during the demonstration? Did they condense the steam to measure the volume that was evaporated? Could it be that most of the water was stored in the apparatus, instead of being evaporated? Note: Carbonnelle is one of the first people to ask the obvious question: where did all the "steam" go? Jan. 18, 2011 Celani is enthusiastic and writes that, according to his calculations, the Jan. 14 demonstration produced a heat output of 15-20 times the electrical input energy. Jan. 18, 2011 Rossi tells Krivit that Melich had observed a test in New Hampshire. 1- The test of Bologna has been directed from experts and they know the difference between dry steam and wet steam. The percentage of water in the steam has been measured. 2- I have been cleared from the issues that have "devastated" Mr. Brian Ahern. 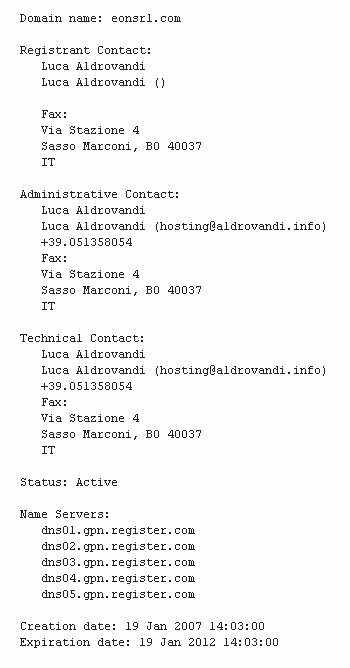 If you go to www.ingandrearossi.com you will find all the documents: I had been accused of crimes from which I have been cleared. I am not here to talk of this past personal tragedy, but if you really want to know what happened, please go there and find the necessary documents. 4- What I have presented is not a theory or a laboratory prototype waiting for the approval of anybody but the market: we are starting an industrial production of out reactors. If somebody has a technology able to compete, the competition will not be on the blogs, but on the market. In this field the time of mental masturbations is over. Now is time for facts, and facts are operating reactors of satisfied customers. 5- I know you and I know you are serious persons: therefore I hope a correct information will start between us from now. Jan. 16, 2011 Rossi writes on his blog that he has a commercial device, available for sale. "We have already passed the phase to convince somebody. We have arrived at a product that is ready for market. Our judge is the market. In this field the phase of the competition in the field of theories, hypotheses, conjectures etc. is over. The competition is in the market. If somebody has a valid technology, he has not to convince people by chattering, he has to make a reactor that works and go and sell it, as we are doing." Jan. 15, 2011 New Energy Times: Rossi Discovery – What to Say? Jan. 15, 2011 Rossi and Levi pose for news photo together. Rossi has his hand around Levi's arm. Jan. 14, 2011 New Energy Times: Rossi and Focardi Energy Amplifier: Reality or Scam? Jan. 14, 2011 Levi organizes press conference and conducts Energy Catalyzer demonstration. Levi performs test with the involvement of other University of Bologna professors. Rossi application: A practical embodiment of the inventive apparatus, installed on Oct. 16,2007, is at present perfectly operating 24 hours per day, and provides an amount of heat sufficient to heat the factory of the Company EON of via Carlo Ragazzi 18, at Bondeno (Province of Ferrara). 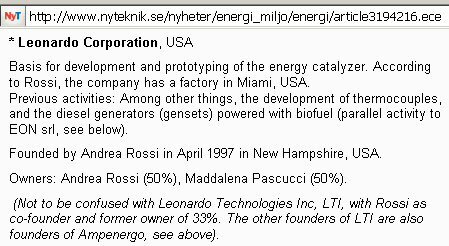 Jan. 13, 2011 Rossi's U.S. Energy Catalyzer patent application states Ni62 is indispensable. Rossi application: For clearly understanding the following detailed discussion of the apparatus, it is necessary to at first consider that for allowing nickel to be transformed into stable copper, it is necessary to respect the quantic laws. Accordingly, it is indispensable to use, for the above mentioned exothermal reactions, a nickel isotope having a mass number of 62, to allow it to transform into a stable copper isotope 62. All the other Ni isotopes, on the other hand, will generate unstable Cu, and, accordingly, a beta decay. Note: According to Rossi, Ni62 is the only isotope that works because all the other isotopes produce unstable products. Rossi always said that his Energy Catalyzer device produces no unstable products. Jan. 13, 2011 USPTO publishes Rossi's 12/736,193 patent application for Energy Catalyzer (filed on Sep. 16, 2010) as publication number US 2011/0005506. 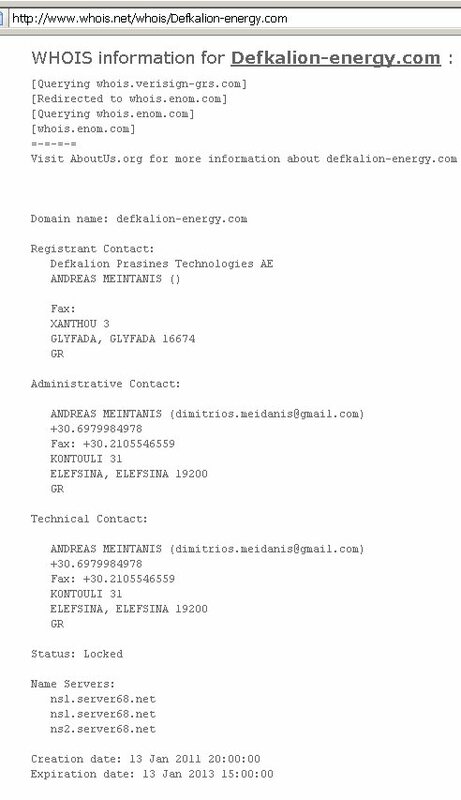 Jan 13, 2011 Defkalion-energy.com domain name registered by Andreas Meintanis. 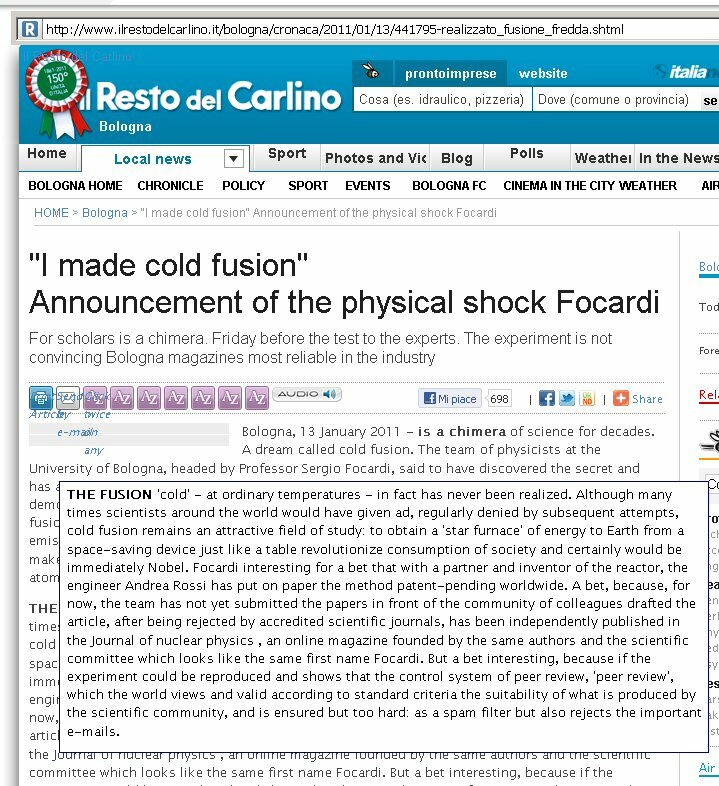 Jan 13, 2011 Il Resto del Carlino reports Focardi's story about submission of paper to journal: "After being rejected by accredited scientific journals, [his paper] has been independently published in the 'Journal of Nuclear Physics,' an online magazine founded by the same authors and the scientific committee which looks like the same first name Focardi." 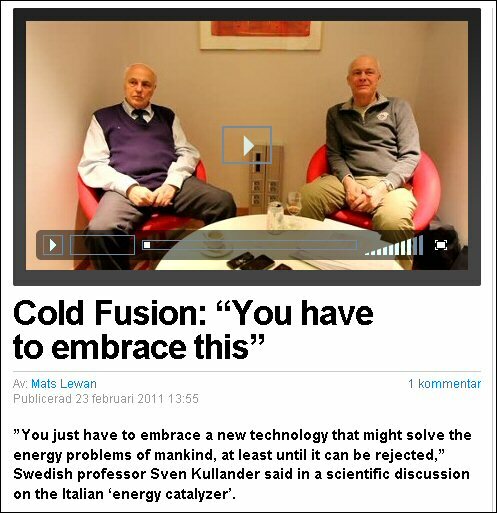 Jan 13, 2011 Focardi quoted in news media: "I have realized cold fusion." Jan. 11, 2011 Levi, as he admitted to Krivit in a later interview, writes and distributes press release for Jan. 14, 2011, Energy Catalyzer demonstration. The title of Levi's press release is: "11/1/11, Press Release (Department of Physics, University of Bologna)", giving the (false) impression that it was issued by the university. The press release was published on the blog "22 Steps of Love," administered by a childhood friend of Levi's, Daniel Passerini, a clerk in a local municiple office. Dec. 28, 2010 Praxen Defkalion Green Technologies Corporation registered in Cyprus. Dec. 28, 2010 Ampenergo domain name registered by anonymous registrant. 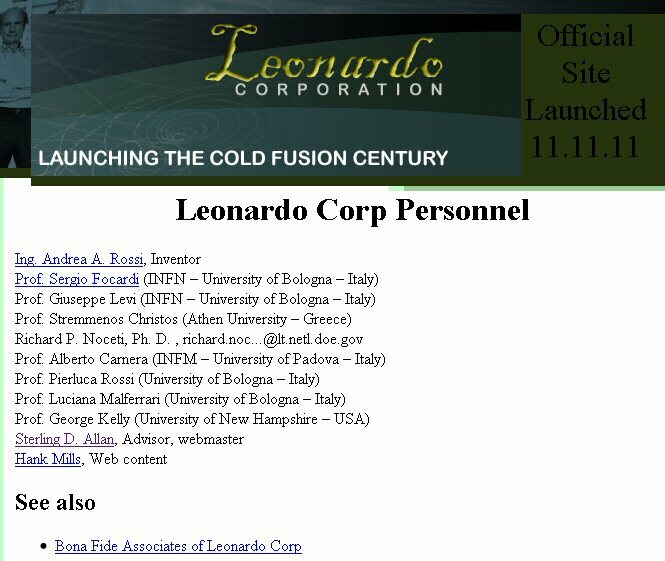 Nov. 8, 2010 Rossi registers Leonardo Corporation in Florida while he has another Leonardo Corporation active in New Hampshire. 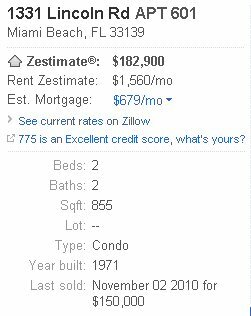 Nov. 2, 2010 Rossi's wife, Maddalena Pascucci, purchases Miami Beach condo #601. Sept. 16, 2010 Rossi files U.S. patent application serial number 12/736,193 of his Energy Catalzyer PCT patent application PCT/IT/2008/000532, which was filed on Aug. 4, 2009. 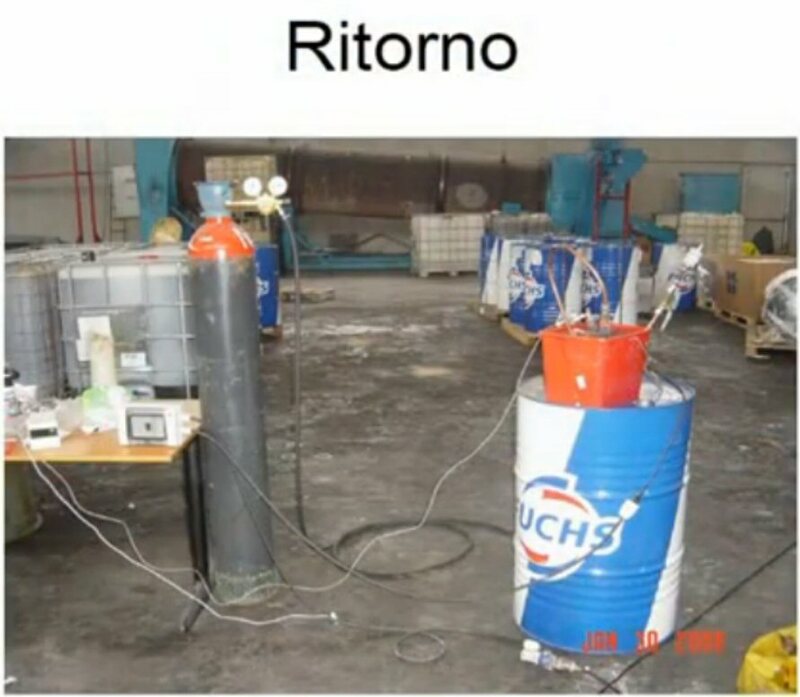 May 6, 2010 Rossi writes on his blog about heating factory with an Energy Catalyzer. Rossi: This fact has been made fror a couple of years as of today, in a factory, producing heat which has been used and which has allowed to the factory which used it to save 90% in the energy bill. April 29, 2010 Rossi writes on his blog about heating factory with an Energy Catalyzer. Rossi: We not just made models and calculations, but we made apparatuses which are working from 2 years now. What we are working on is no more an ‘experimental set’, as you wrongly wrote,it is an apparatus which heats up a factory and of which we are organizing the industrialization. March 12, 2010 Rossi's "Board of Advisers" on this date are: Sergio Focardi, Michael Melich, Richard P. Noceti, Alberto Carnera, Giuseppe Levi, Pierluca Rossi, Luciana Malferrari, Georgy Kelly, Stremmenos Christos. 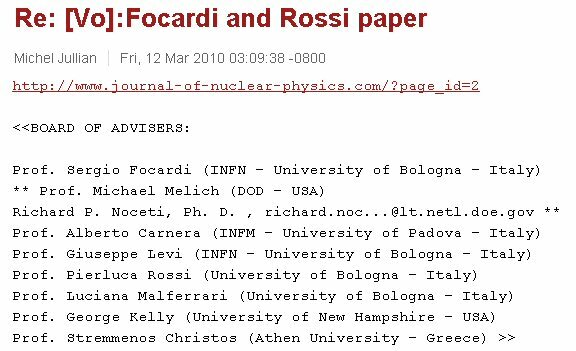 Feb. 28, 2010 Focardi and Rossi post their paper "A New Energy Source From Nuclear Fusion" on Rossi's blog, which he calls the Journal of Nuclear Physics. In their paper, they claim an energy gain of 213 times. According to this document, their first experiment for which they claim to have obtained scientific data took place on May 28, 2008. The document provided no data measurements, no experimental diagram, and provided only minimal details on how the measurements were performed. Rossi and Focardi have never provided any data for any experiment prior to Dec. 16, 2010. Feb. 27, 2010 Rossi creates Journal of Nuclear Physics (JONP) For people unfamiliar with legitimate science journals, Rossi's Web site, which gives (false) impression that the site represents a scientific journal. Rossi chose name similar to the former (real) journal Soviet Journal of Nuclear Physics and the former (real) journal Nuclear Physics. Michael Melich is on board of advisers . Feb. 26, 2010 Piantelli writes to Krivit about his reaction to Rossi's claims. Feb. 26, 2010 Rossi registers "Journal of Nuclear Physics" domain name. Feb. 17, 2010 Francesco Celani tips Krivit off about Rossi "patent" and paper but Krivit disregards the story. Feb. 3, 2010 Daniele Passerini publishes first news story on Rossi. Passerini tipped off by childhood friend, Giuseppe Levi, professor of nuclear physics, University of Bologna. Nov. 12, 2009 University of Padova, Italy performs SIMS analysis on what Rossi claims to be material samples from Energy Catalyzer experiments. Minor changes in many masses. No change in Mass 62. 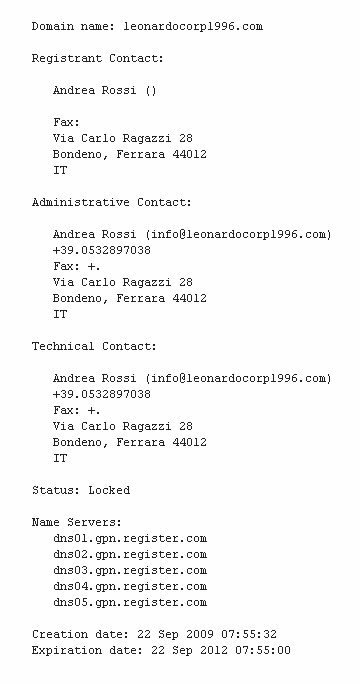 Sept. 22, 2009 Rossi registers domain name leonardocorp1996.com for his Leonardo Corporation. Web site gives appearance that company is associated with another company, EON srl. 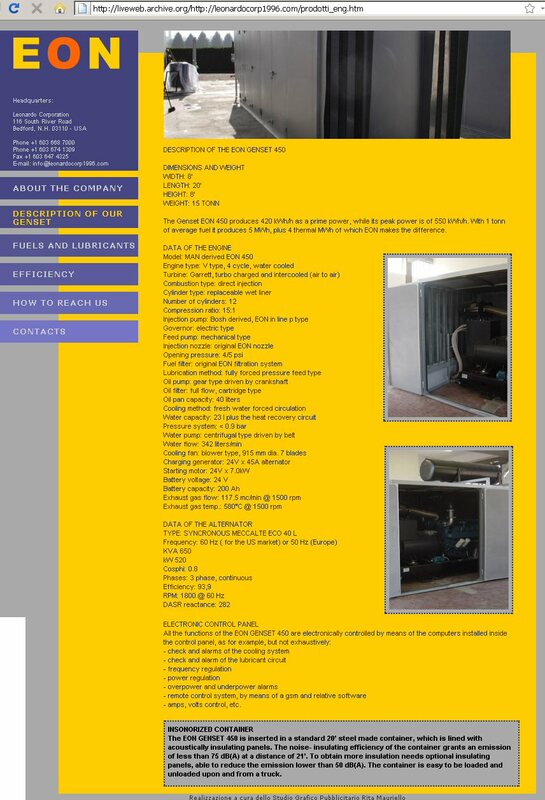 Web site suggests company is in the business of providing large biofuel electrical generators in shipping containers. Another Italian company claims identity theft from an unspecified party. 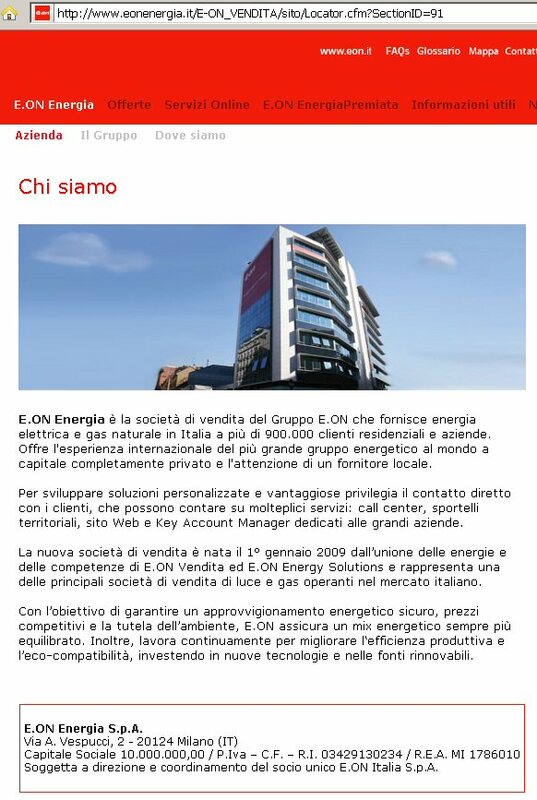 A large European energy corporation called E.ON Energia, exists but is unrelated to Rossi. Email contact for Rossi's Web site goes to eonsrl.com, registered in Bologna on Jan. 19, 2007. (Unverified date) According to Rossi, he performs experiment at ENEL spa, Italy. (Source) Date is not substantiated by any independent reference. Aug. 4, 2008 Rossi files an international PCT application with WIPO (PCT/IT/2008/000532), which is based on his earlier Italian patent application of April 9, 2008 for his Energy Catalyzer. April 20, 2009 Ampenergo corporation registered in Ohio. July 10, 2008 New Energy Times publishes article on Piantelli's Ni-H LENR research. "Piantelli's discovery [led] to perhaps some of the most astounding low-energy nuclear reaction excess-heat results in the LENR field: one cell producing 900 MJ of excess heat over 278 days and another cell producing 600 MJ over 319 days." July 1, 2008 New Italian patent laws which require examination and prior art search take effect. (Unverified date) According to paper written by Focardi and Rossi in 2010, they performed an Energy Catalyzer experiment at this time and recorded data. Rossi reports output/input ratio of 415. (Source) Date is not substantiated by any independent reference. 2008 Levi: Focardi kept on giving us results which were more and more thrilling with energy multiplication factors which were increasingly higher. We were all rather curious. Date is not substantiated by any independent reference. (Unverified date) As claimed by Rossi and Focardi, date of first experiment at which they took data. (Source) Date is not substantiated by any independent reference. The experiment and "lab" which Focardi, at age 78, claimed to use with Rossi looks like this. The experiment and "lab" which Focardi had used with Piantelli looks like this. Oct. 22, 2007 Krivit visits and interviews Piantelli in his personal laboratory in Siena. 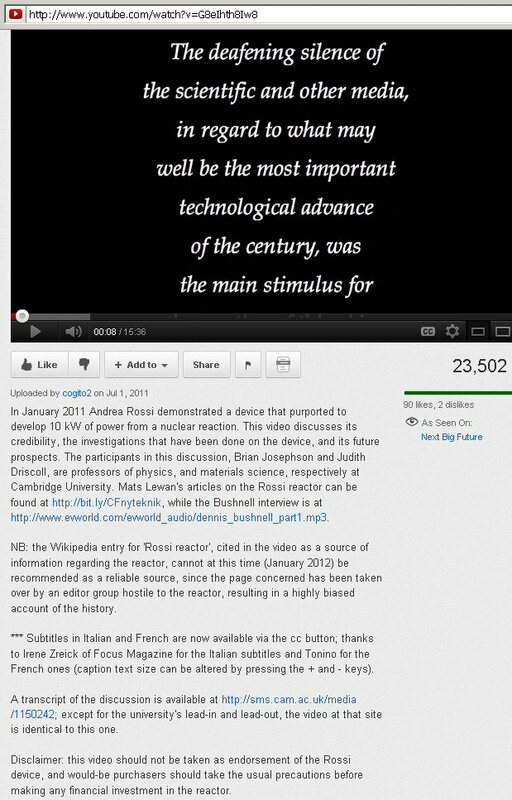 On Oct. 15, 2011, at TEDx Bologna, Focardi claimed that he and Rossi performed their first experiment on Oct. 16, 2007. The Oct. 16, 2007, date is not confirmed. In Focardi's TEDx presentation, he displayed a slide with a photo, allegedly of their first experiment. The date stamp on the photo supports the probability that the Oct. 16, 2007, date is falsified. The date stamp in the photo looks like Jan. 20 2011, 16 days after the first Rossi E-Cat demonstration. The "experiment" depicted in the photo was not taken in a lab, but in the middle of a warehouse/shipping facility for an industrial lubricant. Sept. 10, 2007 Krivit discusses Piantelli work with blogger Vince Golubic. Golubic then locates 2001 Davis patent, US6248221 which references Piantelli patent application. Davis design appears to be similar to Piantelli design but Davis diagrams the flow of water to steam running through center of device. Piantelli patent application had no mention of producing steam, only hot water. May 14, 2007 Krivit learns from Lewis Larsen about "forgotten" Piantelli-Focardi-Habel experiments. Krivit begins discussing their work with people in the field. Krivit tells a few people in the field that he intends to visit the Piantelli lab in October. Jan. 19, 2007 Rossi registers EONsrl.com domain name. July 14, 2006 Swedish physicist Hanno Essén uploads preprint "Catalyzing Fusion with Relativistic Electrons," to arXiv. Feb. 2, 2005 Roland Pettersson, Hidetsugu Ikegami and Lars Einarsson publish "Observation of enormously enhanced nuclear fusion in metallic Li liquid" Research is supported by Sven Kullander. Dec. 31, 2003 Rossi files application for second U.S. patent on thermoelectric generator (10/749,370, later published as 2005/0028848). This application was abandoned by Rossi in 2008 after being rejected by the USPTO in 2007. Sept. 2002 Rossi's thermoelectric devices now made at new Leonardo Technologies plant in New Hampshire. 2000 According to Rossi, fire destroyed Rossi's LTI Manchester, NH location, forcing him to make alternate plans for manufacture of thermoelectric devices in Italy. Aug. 26, 1999 USA Nuclear Laser, Inc. changes name to Leonardo Technologies Inc.
June 2, 1998 USA Nuclear Laser, Inc. registered in Ohio. (Incomplete registration on May 18, 1998) According to Lewan, company is founded by Andrea Rossi, Robert Gentile and Craig Cassarino. April 22, 1997 Rossi registers Leonardo Corporation in New Hampshire as the sole incorporator. Corporate documents show that Rossi is the sole officer and director. 1994 Piantelli, Focardi and Habel publish first Ni-H gas LENR paper. Cell "A" produced 38.9 +/-1.5 watts of heat, and cell "B" produced 23.0 +/-1.3 watts of heat. The cells produced excess power continuously at a slowly increasing rate during that period: cell "A" for 278 days; cell "B" for 319 days. The integrated excess energy was 900 MJ for cell "A" and 600 MJ for cell "B." Nov. 28, 1990 Italian Senate report reviews Petroldragon. Text of Italian Senate Report including English translation. Oct. 8-13,1990 Piantelli meets Roberto Habel, professor of physics, University of Cagliari and Sergio Focardi, professor of physics, University of Bologna when he presents his results at the National Conference of Italian Physics Society in Trento. Collaboration among the trio begins several months later. Other collaborators who join later are Valerio Gabbani, Adrian Battle, Vera Montalbano, Pier Giorgio Sona, Lino Daddi, Stefano Veronesi, Cesare Stanghini, Giuseppe Fasano. March 23, 1989 Stanley Pons and Martin Fleischmann announce fusion discovery at University of Utah . 1979 According to Rossi, he obtains a degree in chemical engineering from the University of Kensington, in California. That university was later determined to be a diploma mill and shut down by government authorities. 1971 According to Rossi, he begins Petroldragon activities, a commercial attempt to turn household and industrial waste into oil.